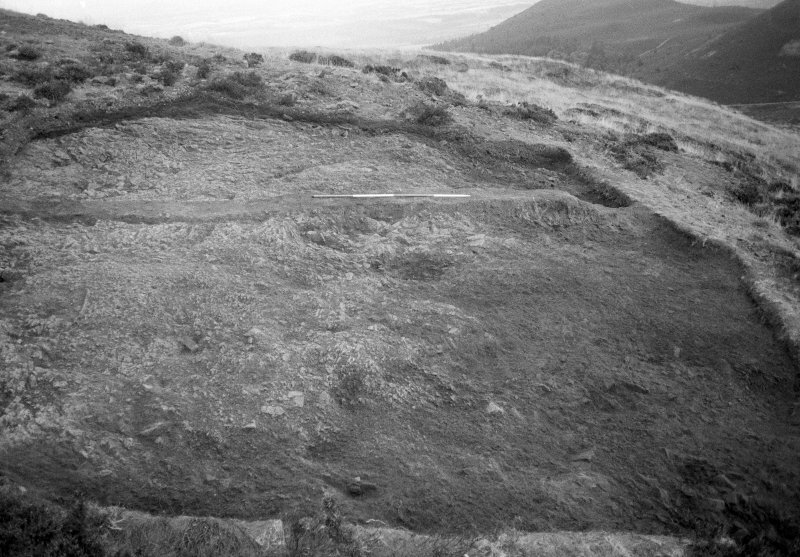 Excavation photograph : area III - north section from south (contin from pic 278) - 1st of 6 photos, from east end. 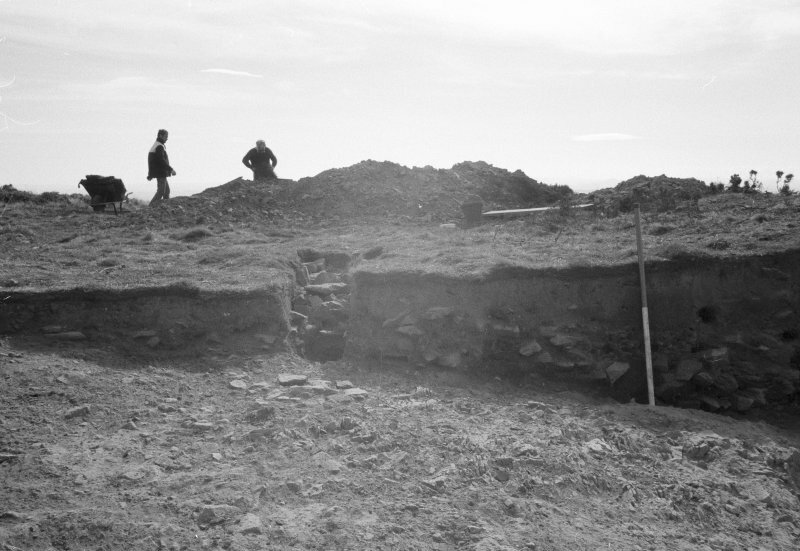 Excavation photograph : area III - north section, from south (continued from 262) - 3rd photo of 3 from east end. Excavation photograph : area II - f220 looking east. 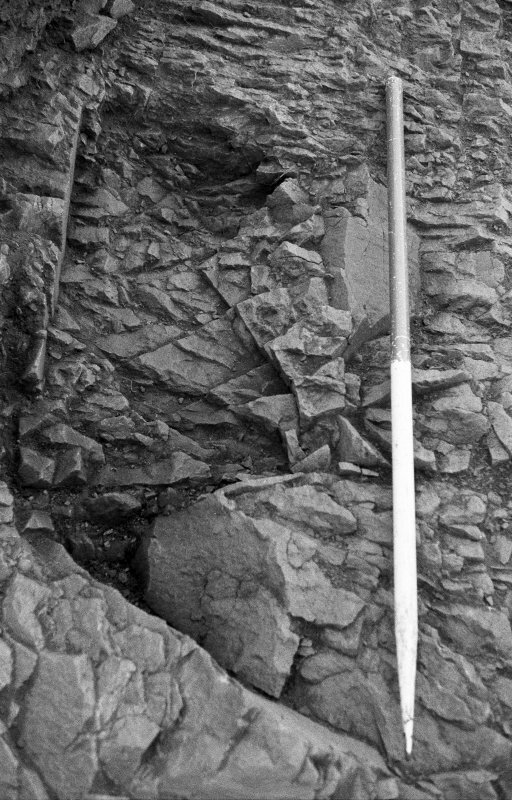 Excavation photograph : area II - southern half, rock face, looking east. 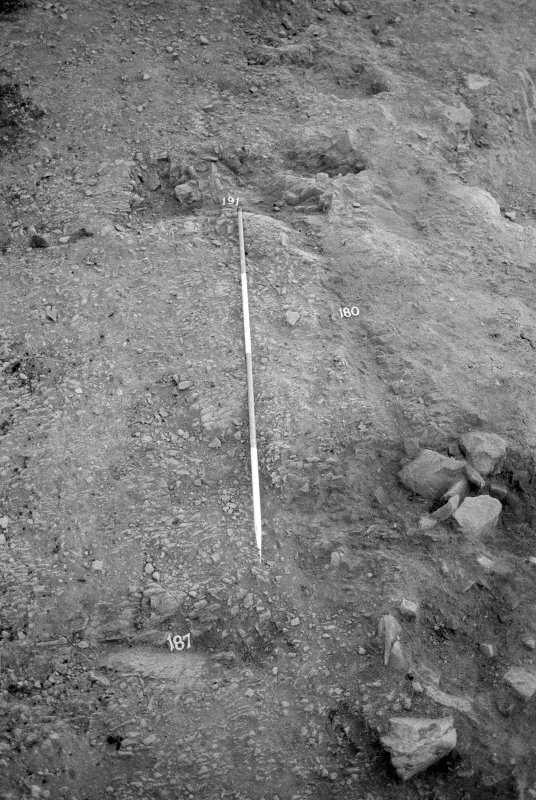 Excavation photograph : area II - northern half, western limit of rock, looking south. 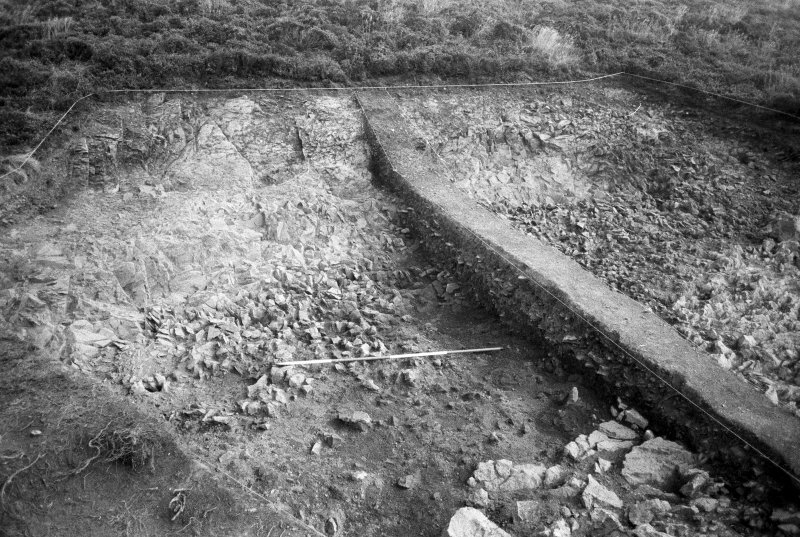 Excavation photograph : area II - face of cut ledge and back wall in northern half, looking east. 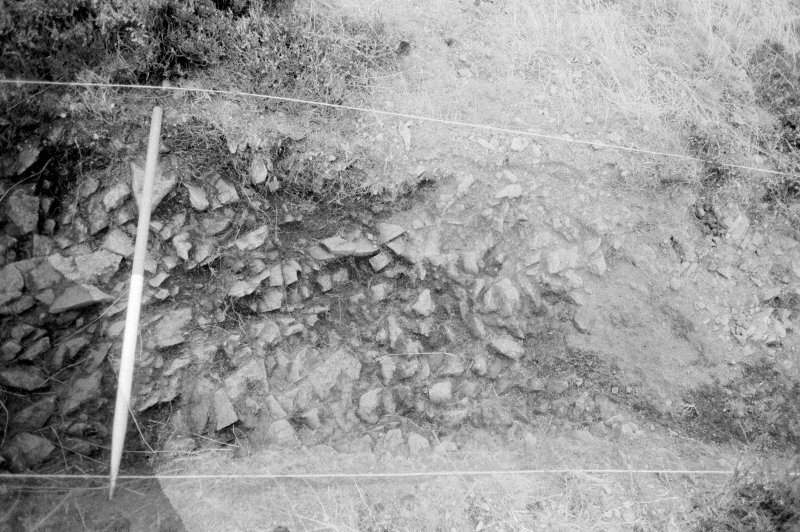 Excavation photograph : area IV - f402 pseudo ditch created from natural at west end, from north. 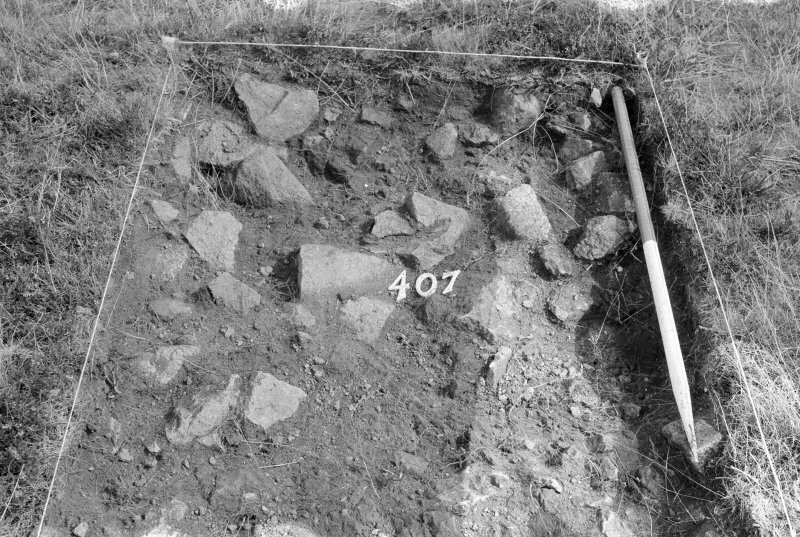 Excavation photograph : area II - f207, looking north, north-east. 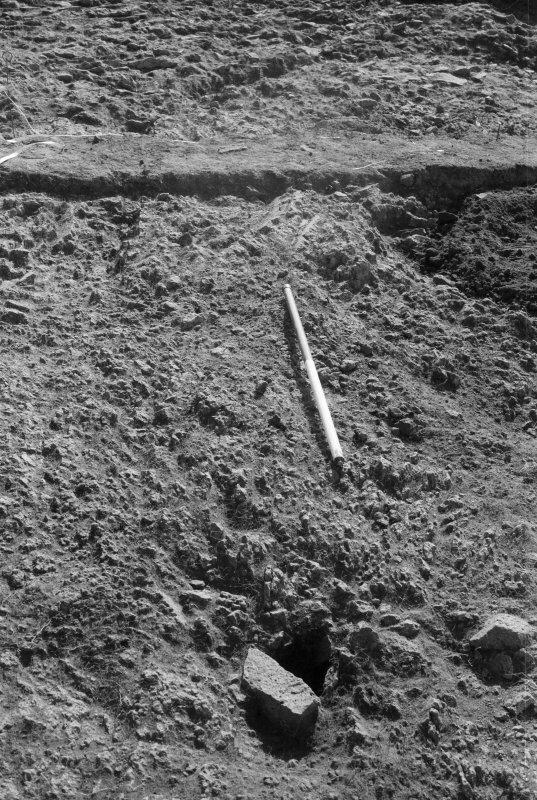 Excavation photograph : area IV - f405, posthole, vertical. 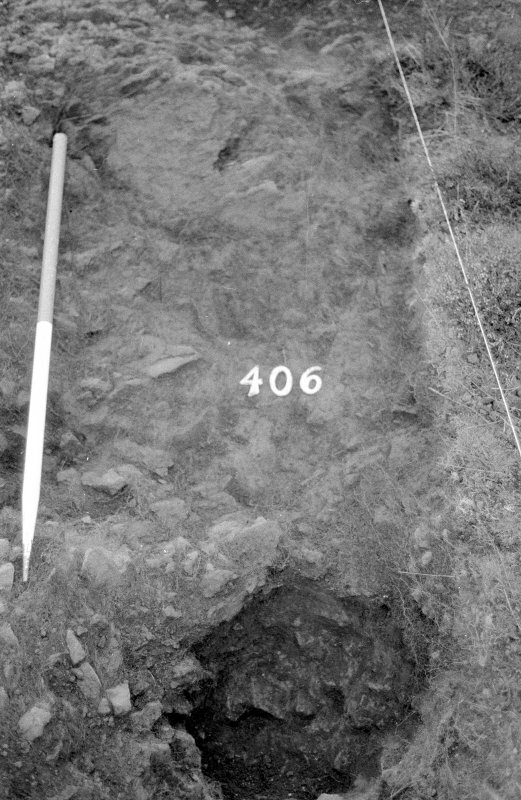 Excavation photograph : area IV - f403, looking west. 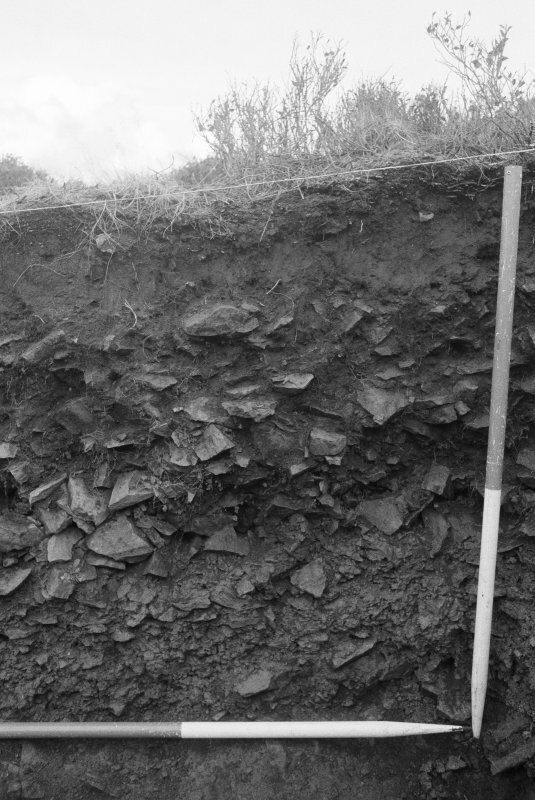 Excavation photograph : area II - before deturfing, looking west. 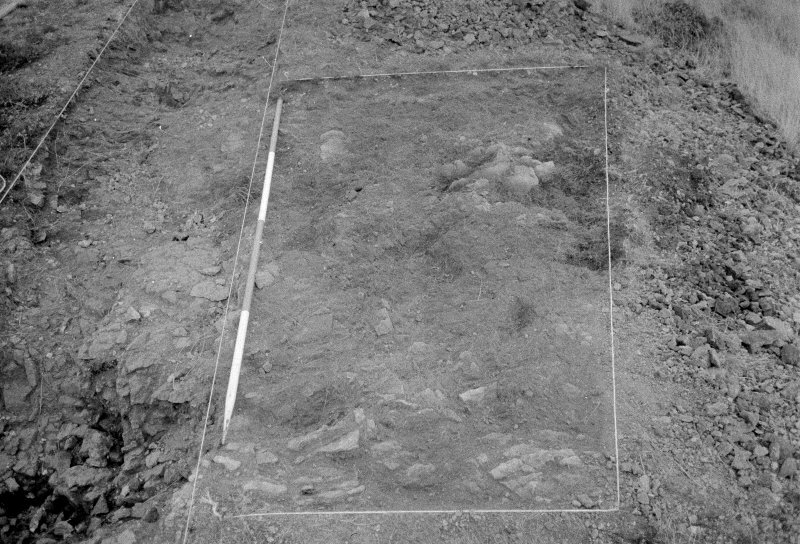 Excavation photograph : area I - south section, E-W mosaic, 4th part. 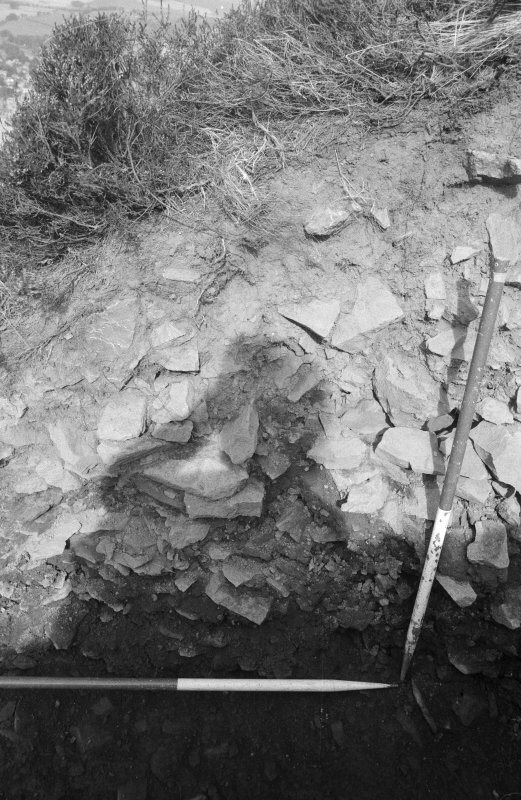 Excavation photograph : area I - south section, E-W mosaic, 3rd part. 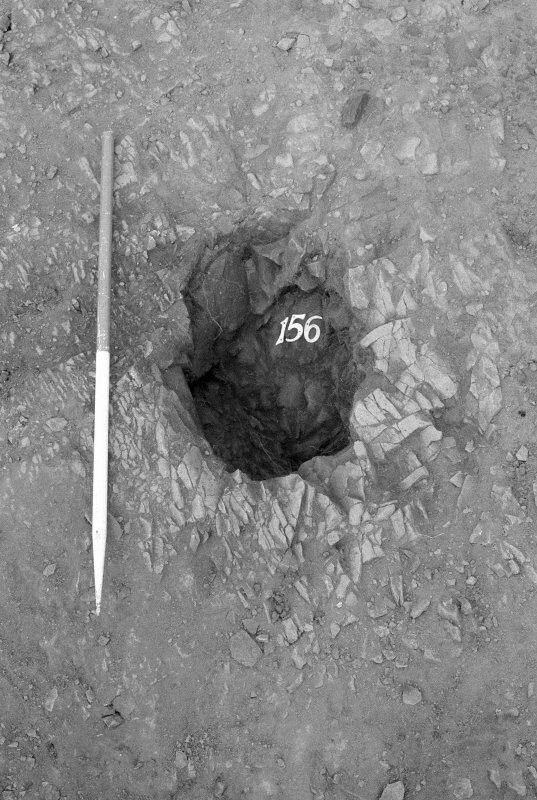 Excavation photograph : area VII - posthole f719 and groove, looking south. 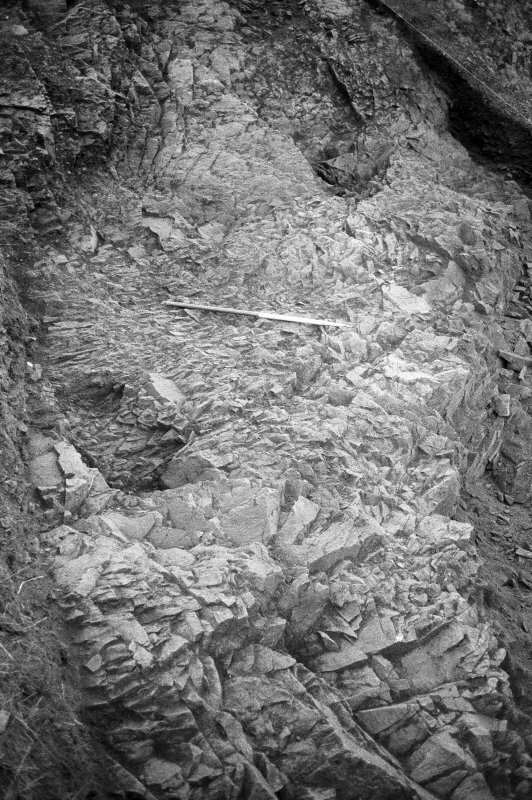 Excavation photograph : area I - stones f167 with fill 166 in cut 168, from S.
Excavation photograph : area V - f502, from north (detail). 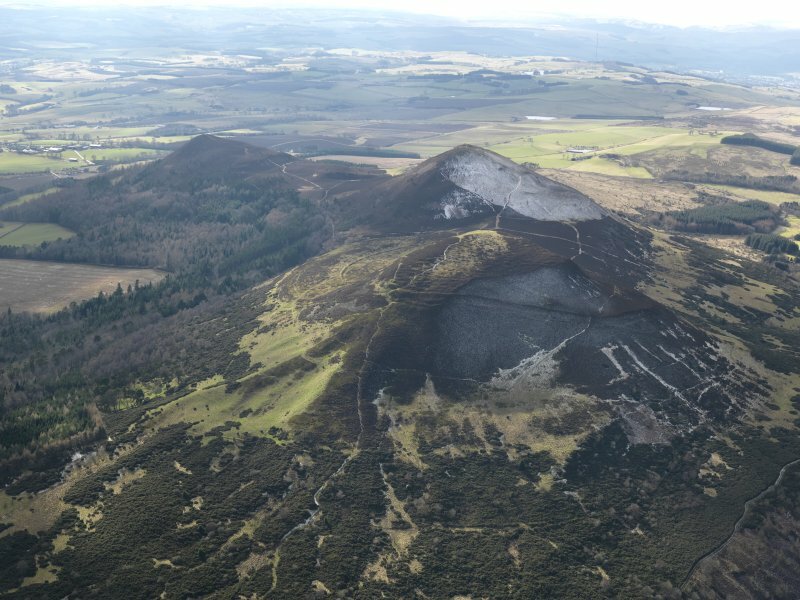 Oblique aerial view of the Eildon Hills, looking NE. 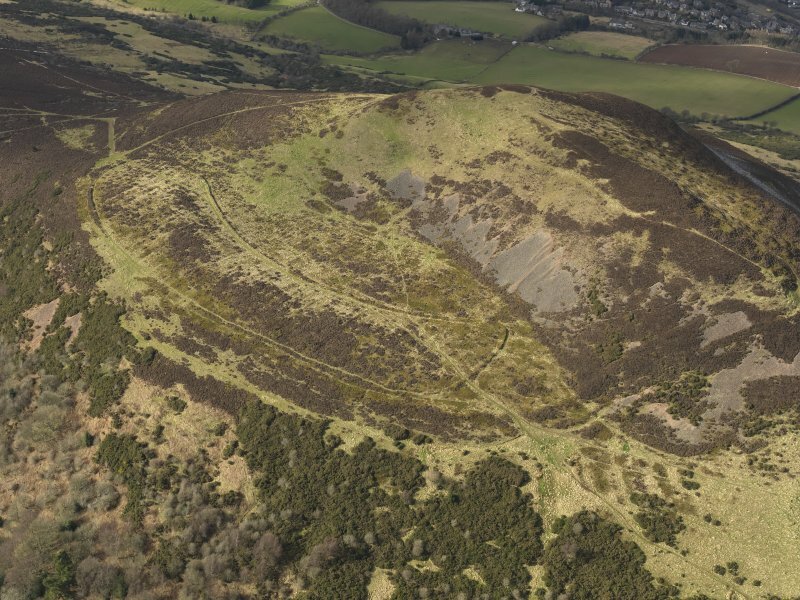 Oblique aerial view of Eildon Hill North fort. 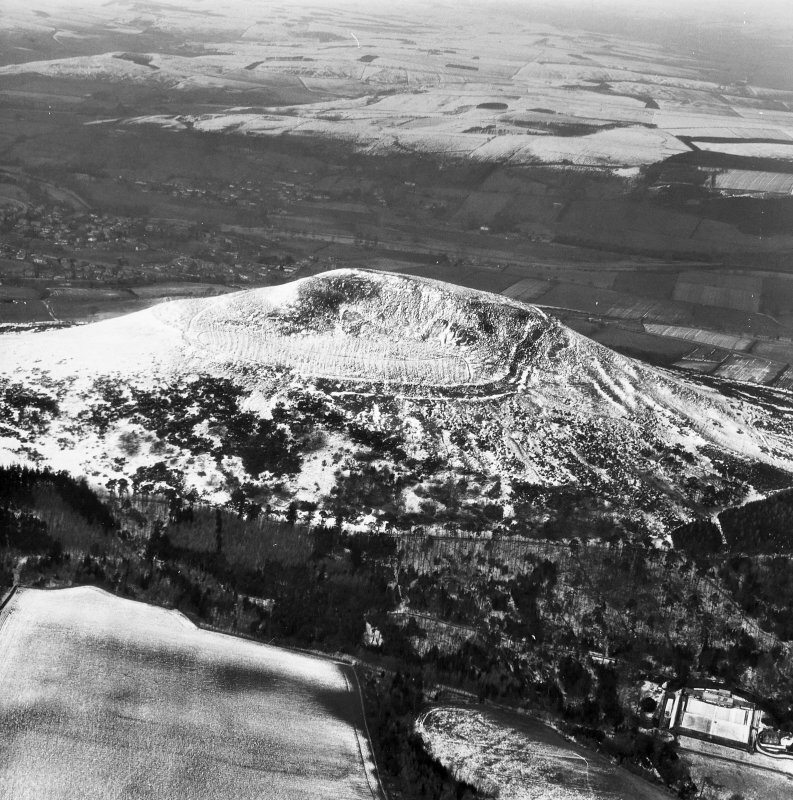 Oblique aerial view of Eildon Hill North fort, looking NNW. 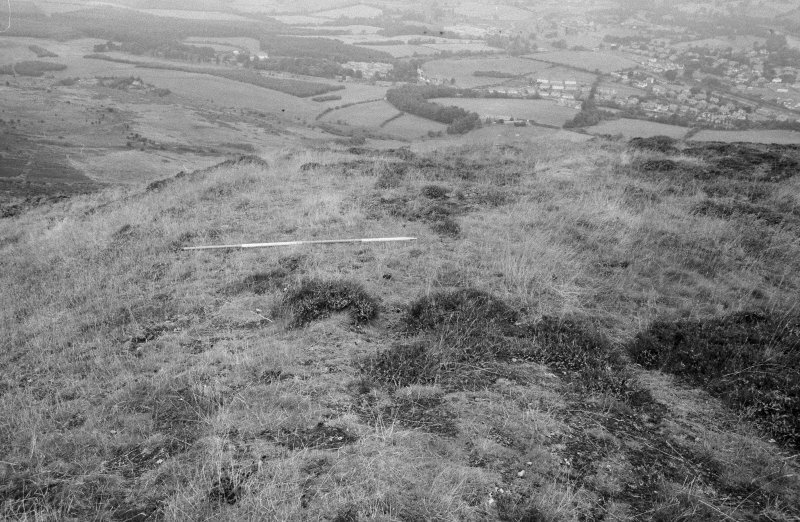 General oblique aerial view of Eildon Hill North fort, looking SE. General oblique aerial view with the railway viaduct in the foreground and the village, town and remains of the fort in the distance, taken from the NE. 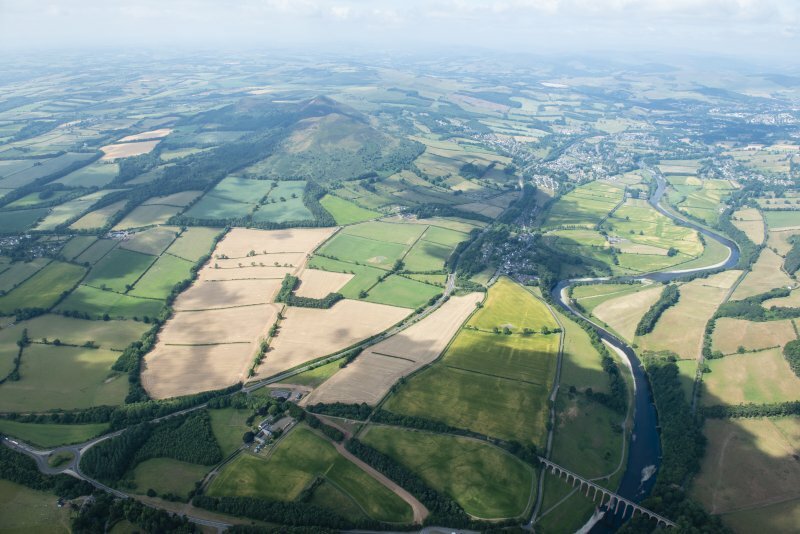 General oblique aerial view centred on the cropmarks of the Roman fort and Roman temporary camps with the town, village and remains of the fort in the distance and the railway viaduct and road bridge in the foreground, taken from the NNE. 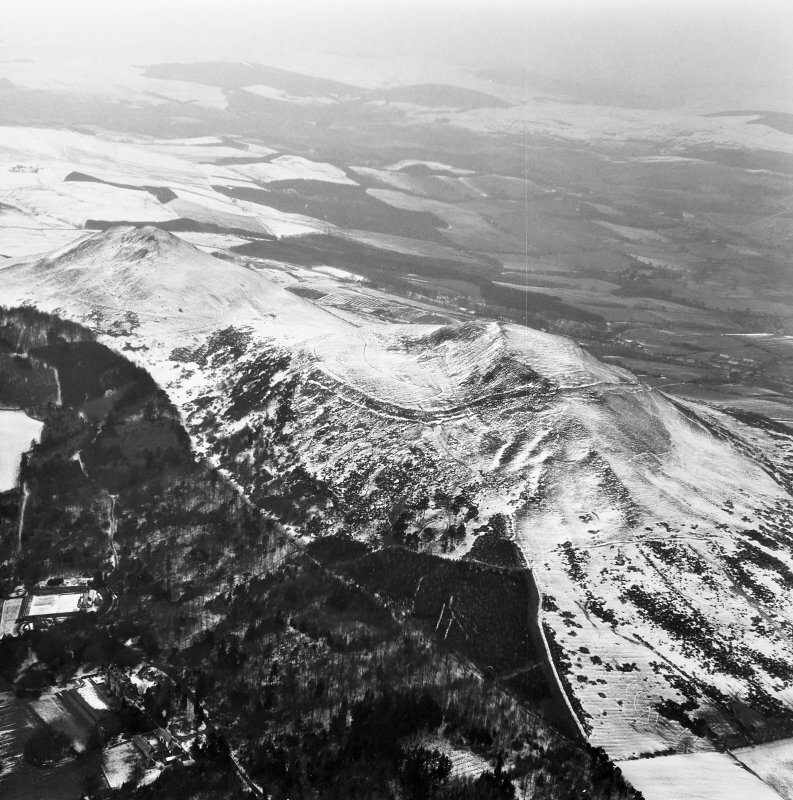 General oblique aerial view centred on the remains of the fort and the Eildon Hills with the town in the foreground, taken from the NNW. Excavation photograph : area VII - final photo, looking south. Excavation photograph : area II - f221 and 222 looking south. 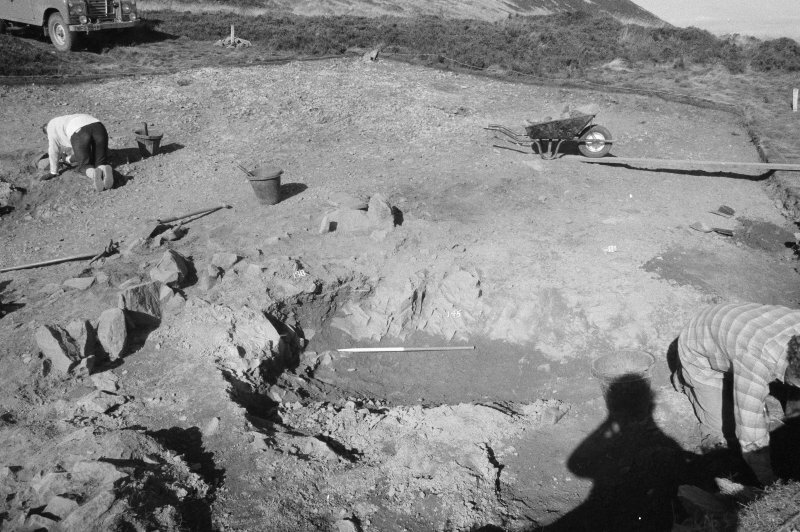 Excavation photograph : area II - southern half, looking west. 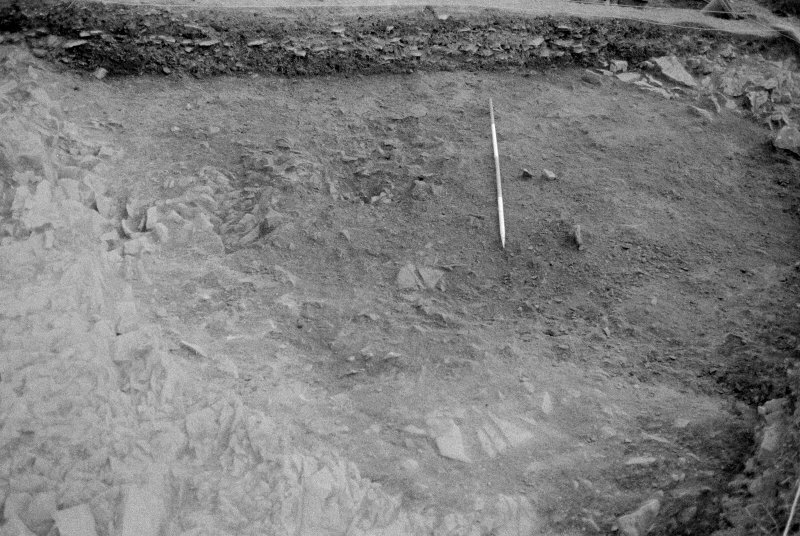 Excavation photograph : area II - overall view, looking east. 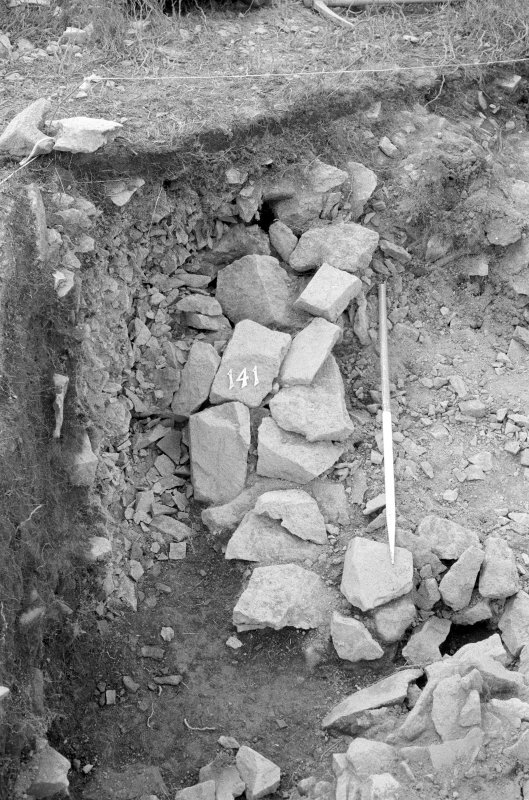 Excavation photograph : area II - pot l52, looking east-southeast. 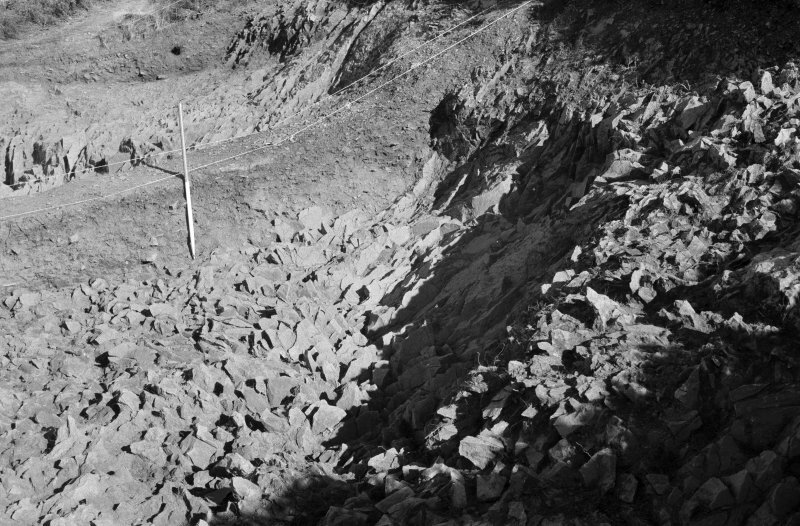 Excavation photograph : area II - f214, looking east. 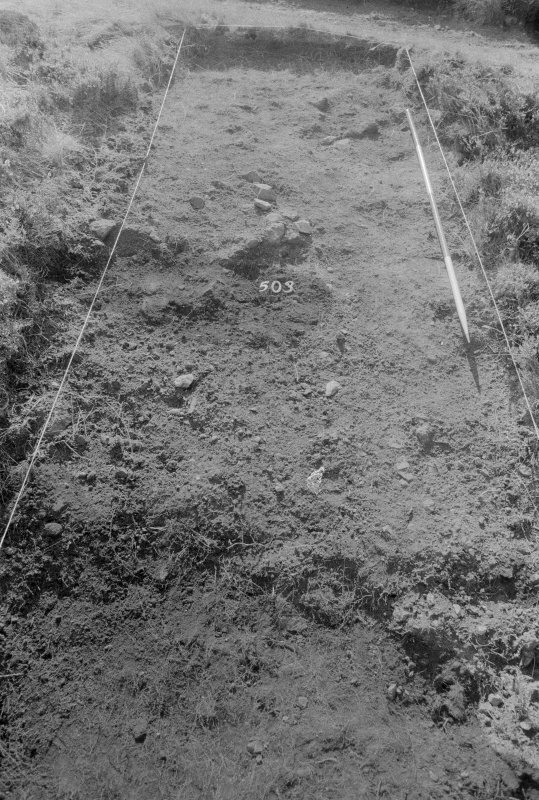 Excavation photograph : area III - pre ex, east end, looking south,south-west. Excavation photograph : area II - f202 against 203, looking north-east. 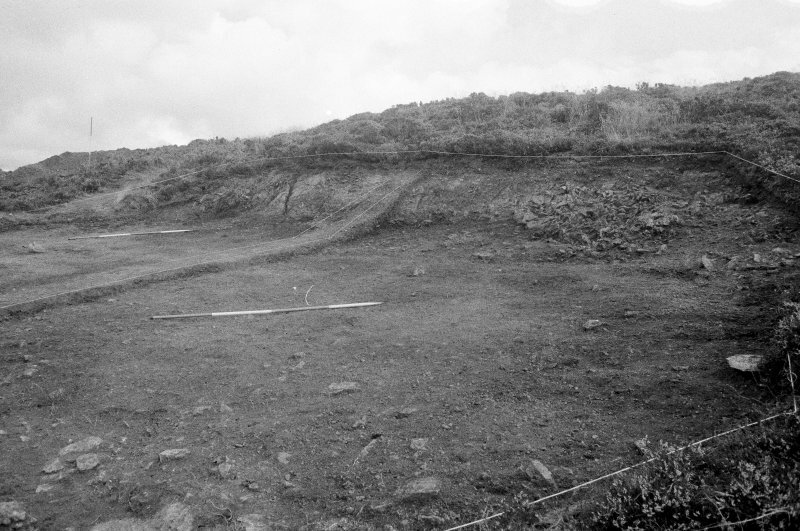 Excavation photograph : area II - pre-excavation, looking north. Excavation photograph : area I - final photos of south rampart, from west. 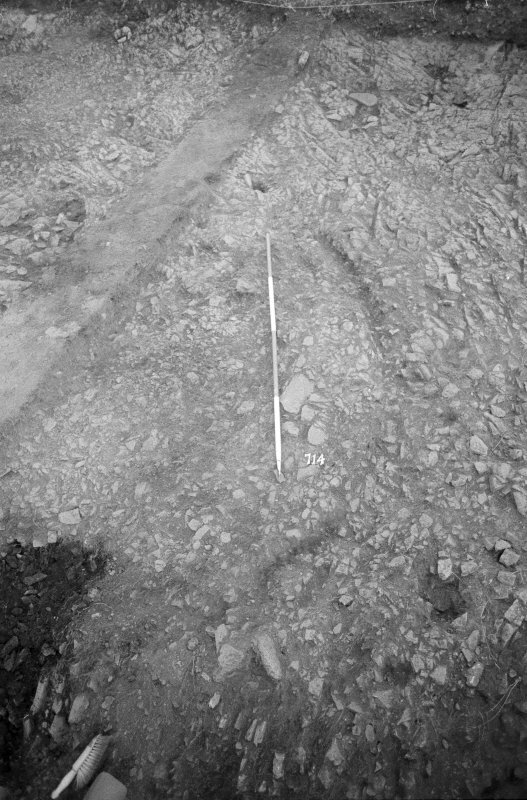 Excavation photograph : area VII - f712 (at level) looking west. 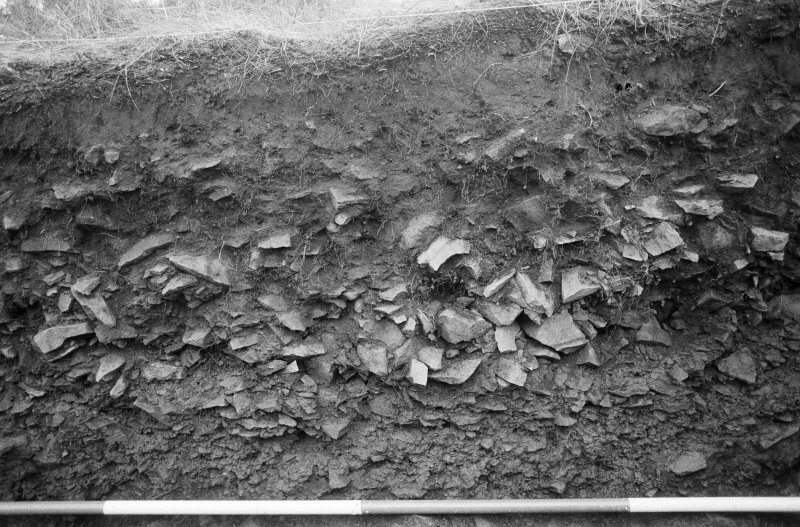 Excavation photograph : area I - f165 emptied, from S.
Excavation photograph : area I - stone setting, f160, from S.
Excavation photograph : area I - f157/158/159 prior to excavation, from W.
Excavation photograph : area I - cut f145, from SW.
Excavation photograph : area VII - at level of f705, looking west. 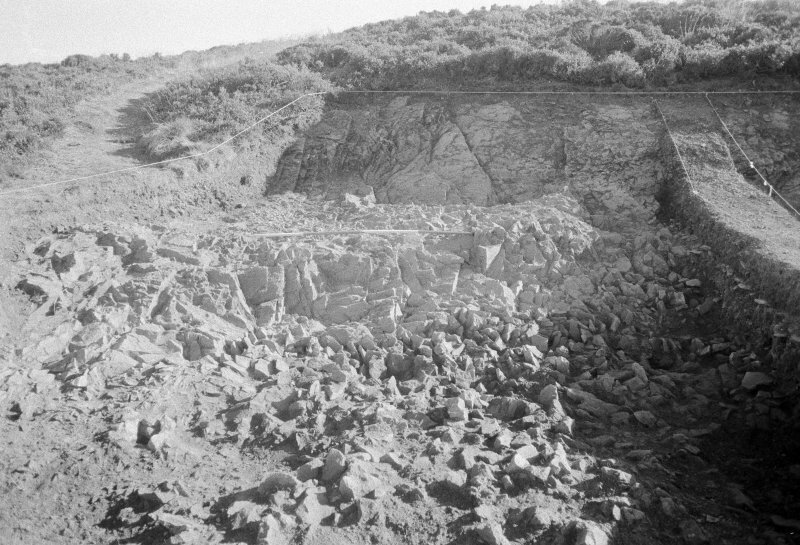 Excavation photograph : area VII - at level of f705, looking south. 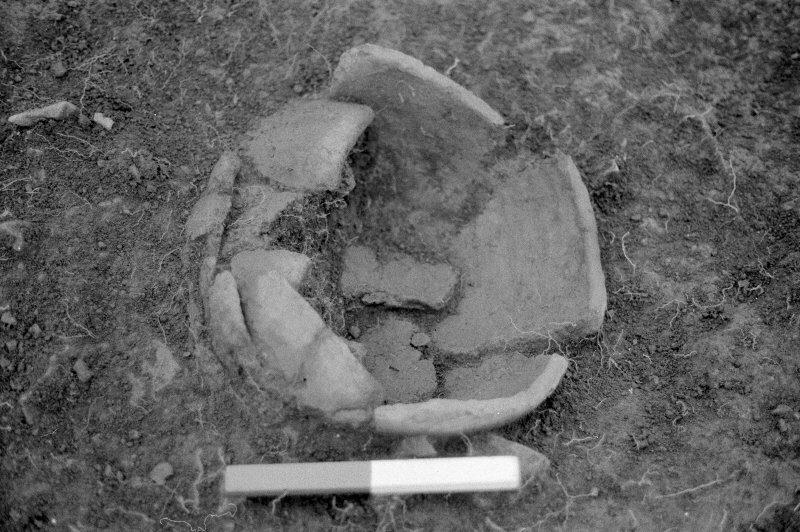 Excavation photograph : area VII - pot 266 in situ, in f702. 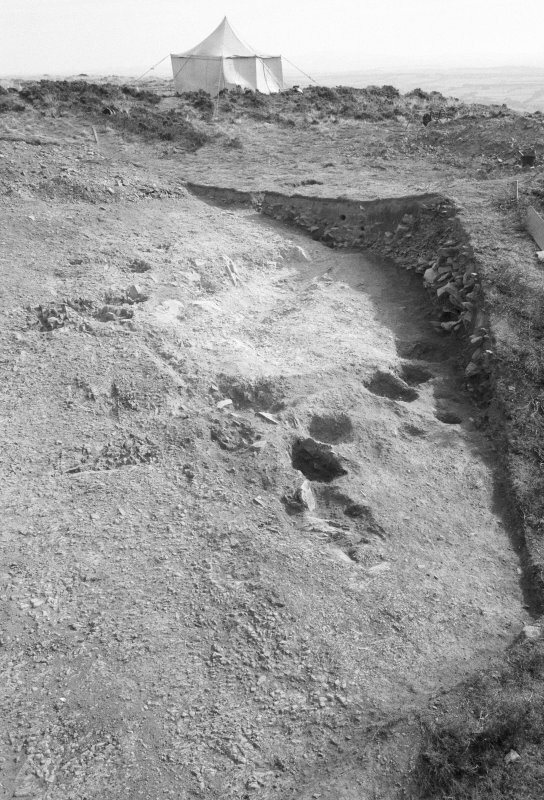 Excavation photograph : area I - f141, from east. 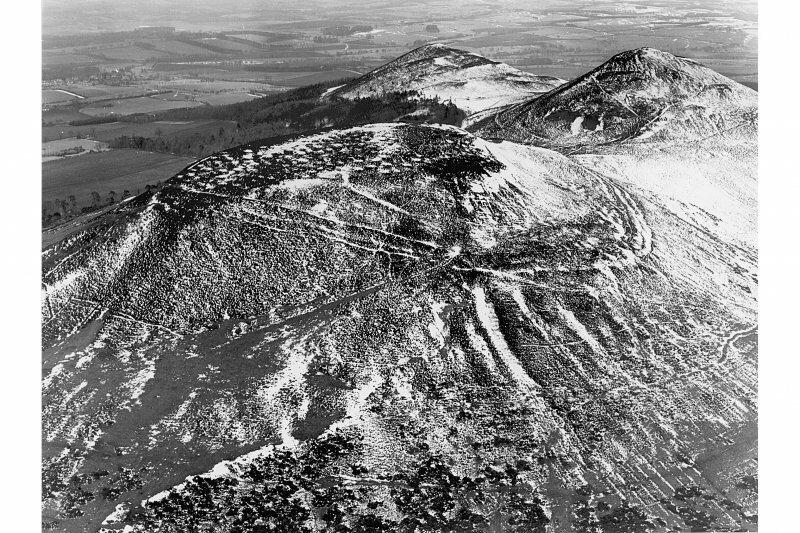 Excavation photograph : area I - f110 and 133, south rampart, from W.
Excavation photograph : area IV - f410, from W.
Excavation photograph : area IV - f409, from W.
General oblique aerial view of Hawick with the Eildon Hills in the distance, looking NNE. 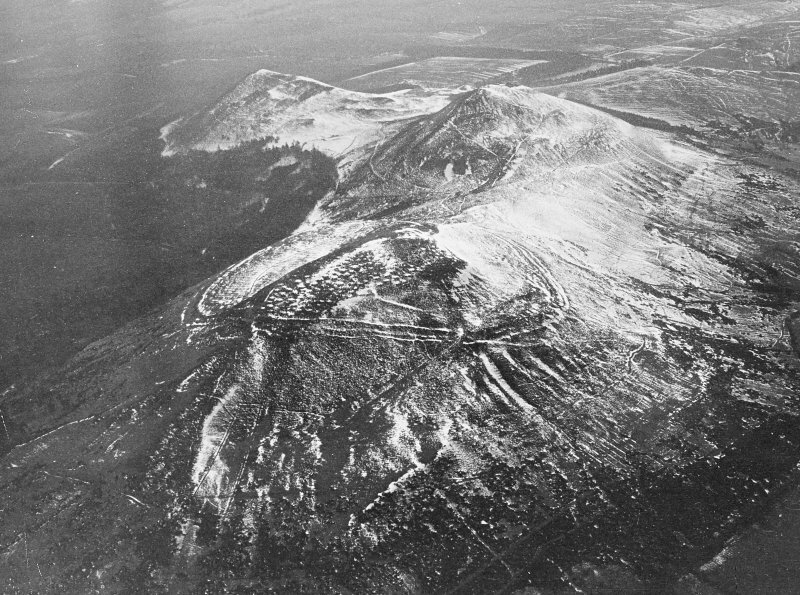 General oblique aerial view centred on the remains of the fort with the village in the distance, taken from the SW.
General oblique aerial view centred on the remains of the fort and the Eildon Hills with the town in the foreground, taken from the N.
Excavation photograph : area III - north section from south (contin from pic 278) - 3rd of 6 photos, from east end. 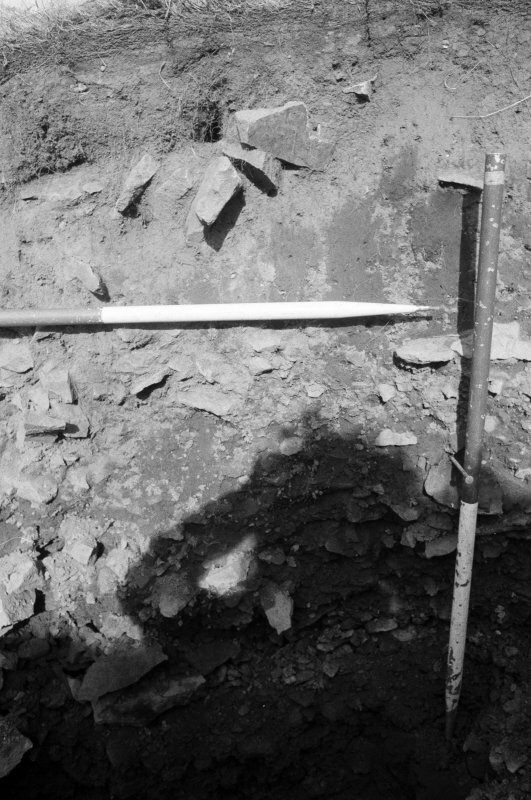 Excavation photograph : area VII - final photo, looking west. 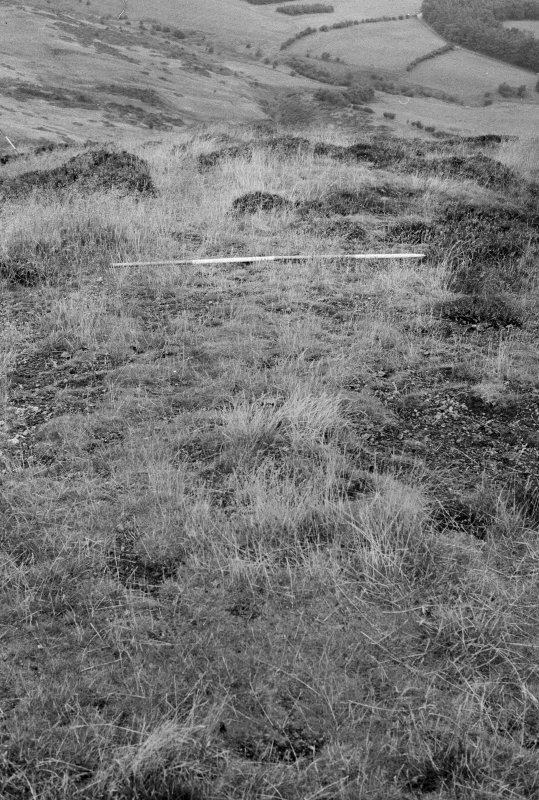 Excavation photograph : area VII - slot 714 looking north-east. 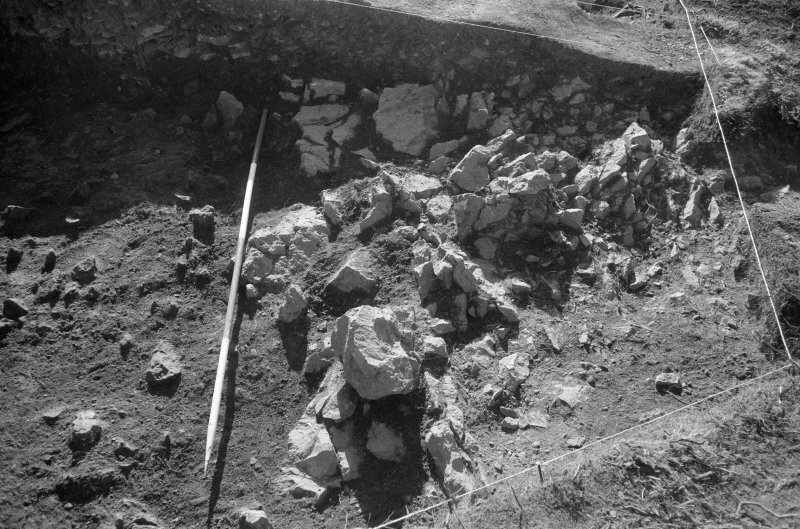 Excavation photograph : area II - rockwall and ledge, looking east (northern half). 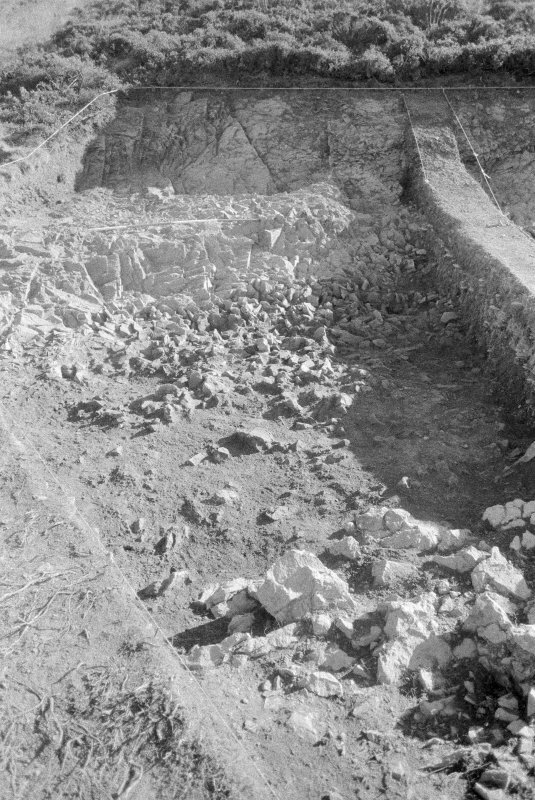 Excavation photograph : area II - f216, looking east (northern half). 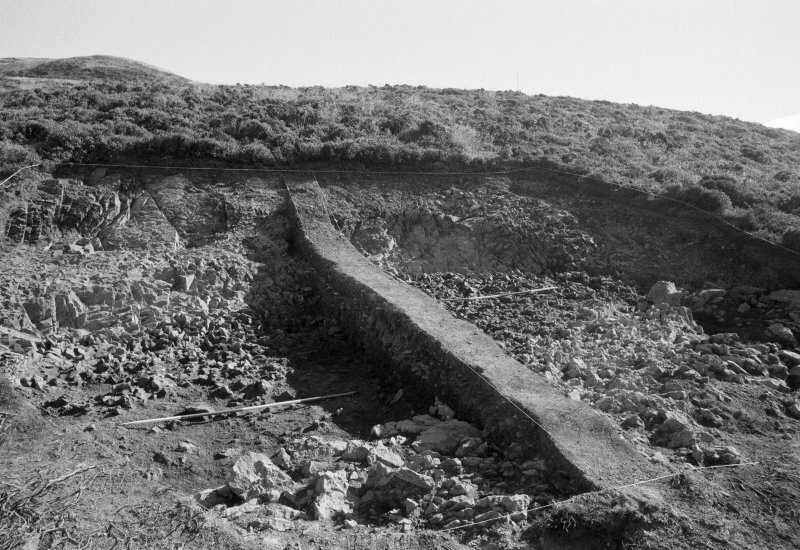 Excavation photograph : area IV - f407, from west. 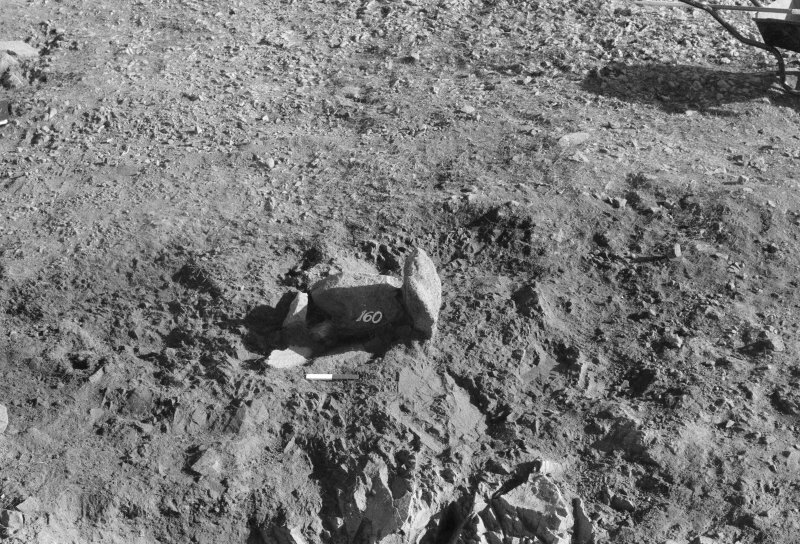 Excavation photograph : area IV - f406, from east, detail. 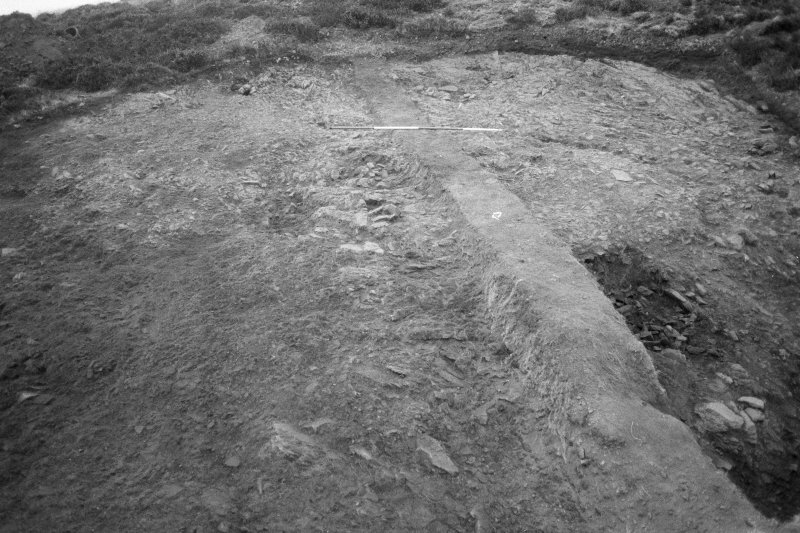 Excavation photograph : area IV - before excavation, looking west,north-west, wide angle. 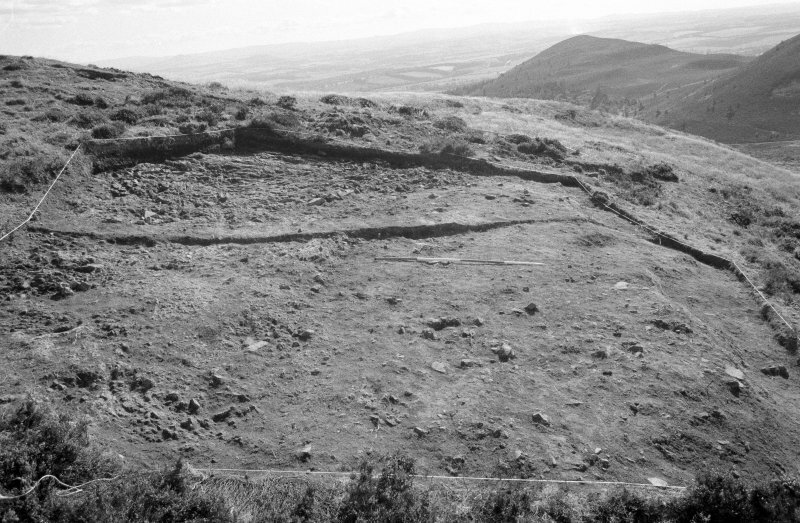 Excavation photograph : area IV - before excavation, looking west,north-west. 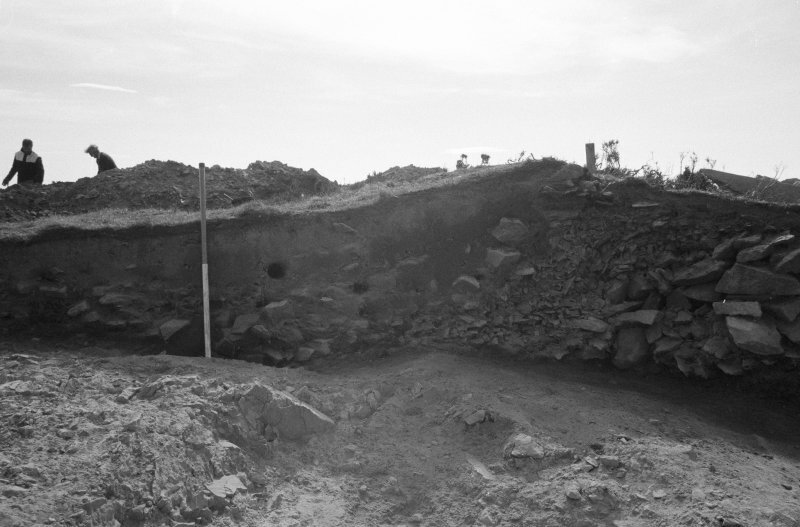 Excavation photograph : area VII - f714, semi/circular slot, from west. 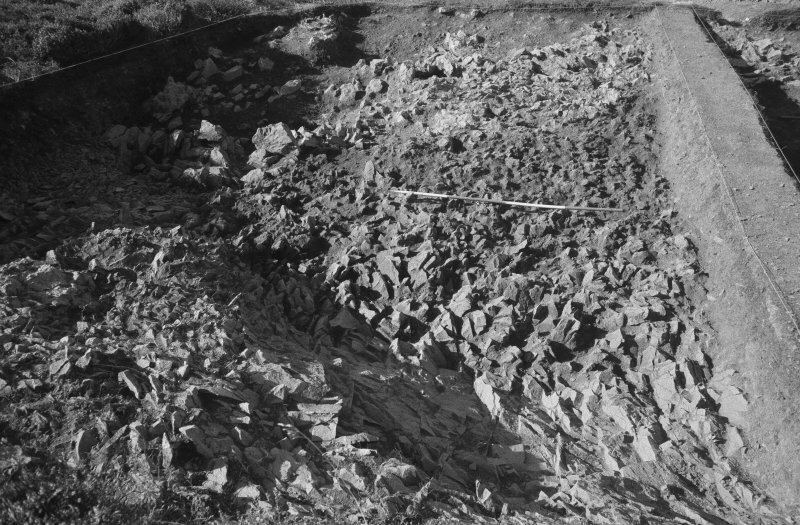 Excavation photograph : area I - f180, 187, 191, from east. 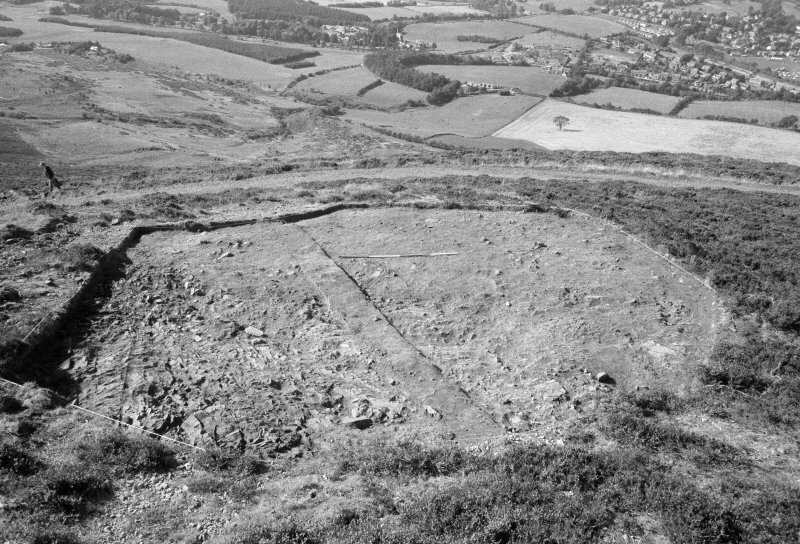 Oblique aerial view of the E side of Eildon Hill North fort, looking E.
Oblique aerial view centred on the remains of the fort with Eildon Mid Hill adjacent, taken from the E.
Excavation photograph : area III - some part of section in pic 278, from south-east. 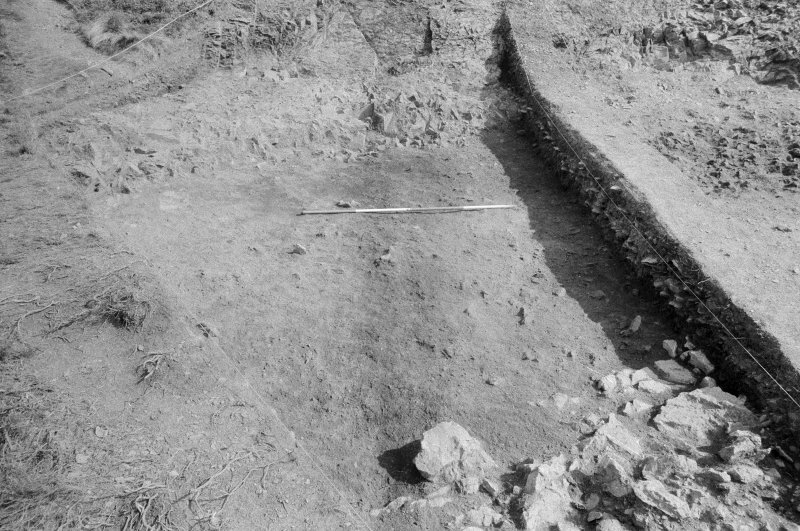 Excavation photograph : area III - east end section, facing east. 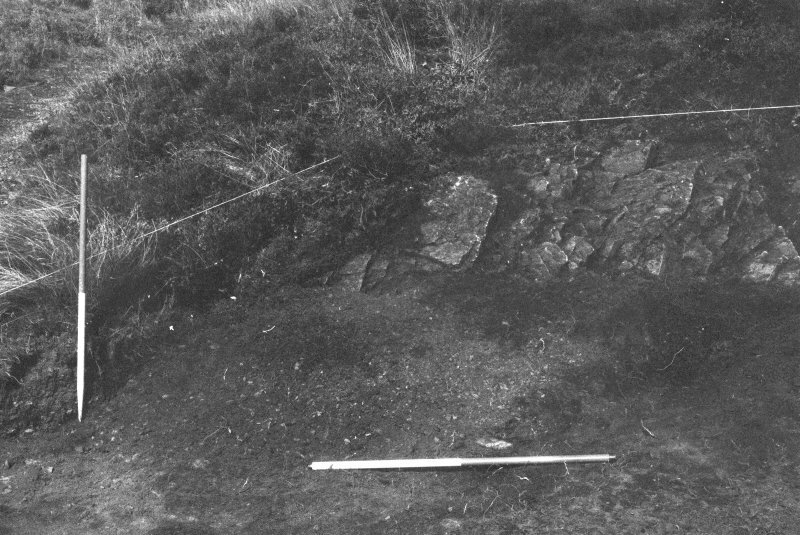 Excavation photograph : area II - rock ledge - features, looking south-east. 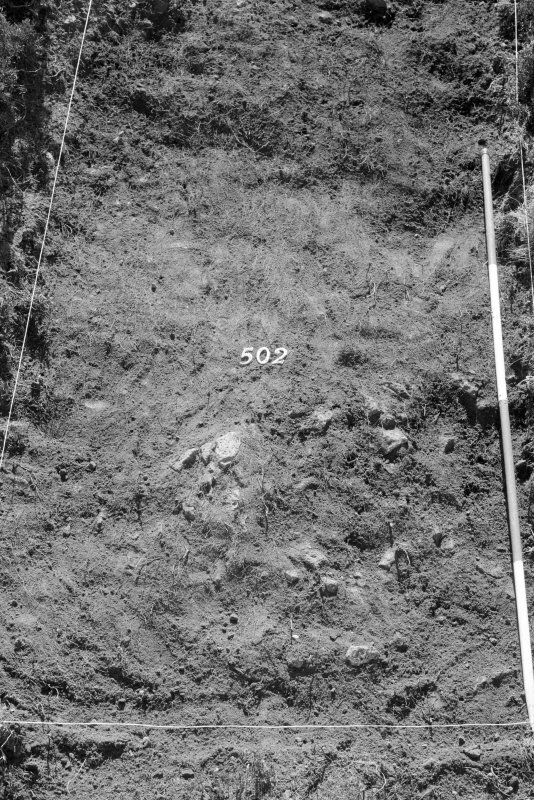 Excavation photograph : area VII - half of north area, overall, looking east, at 715. Excavation photograph : area V - f503, from north. 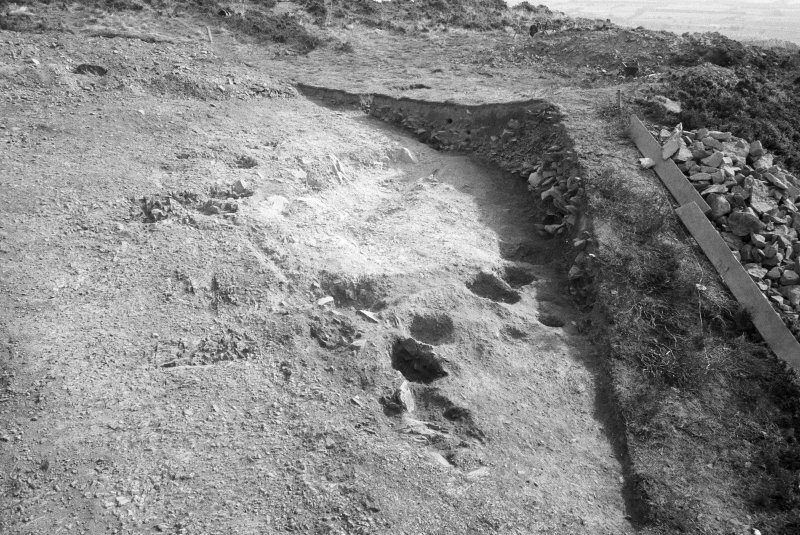 Excavation photograph : area VII - before deturfing, looking west. 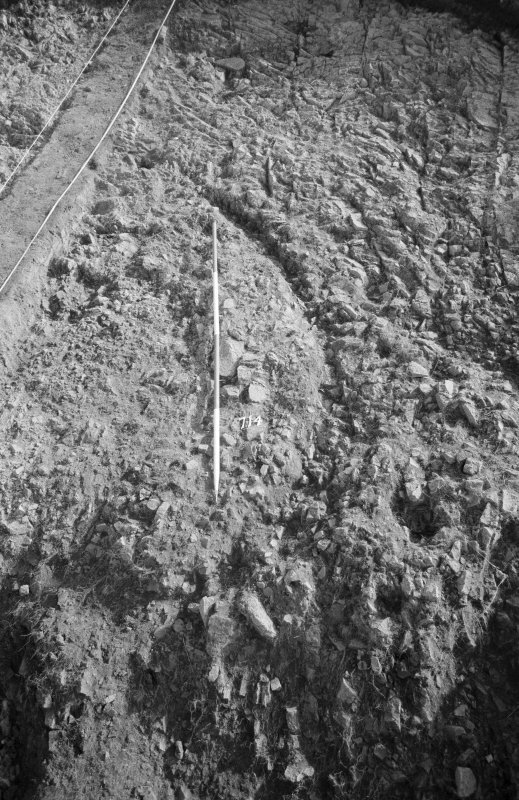 Excavation photograph : area IV - f402 pseudo palisade trench created from natural under posthole f405, from north. 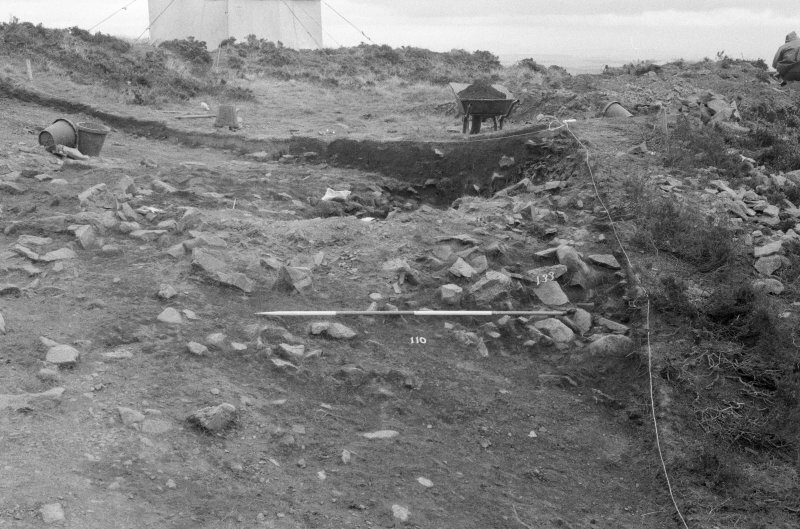 Excavation photograph : area II - f204, looking north-east. 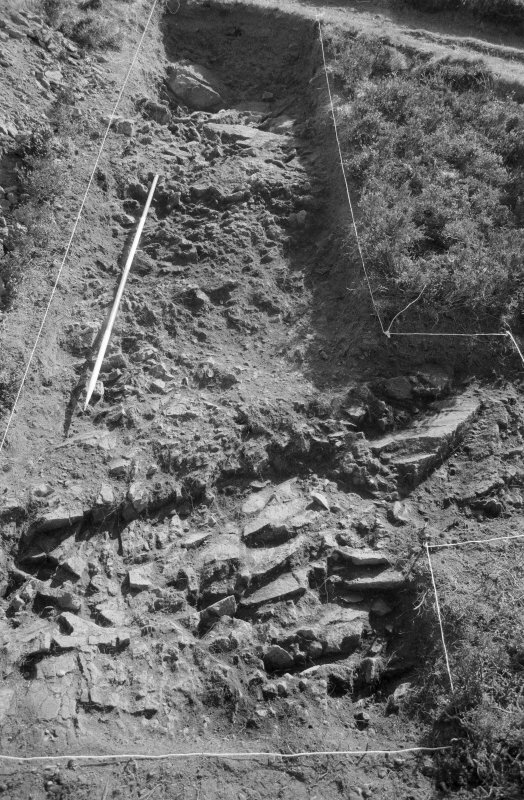 Excavation photograph : area I - north rampart and track, looking north, f102, 106, 109, 111. 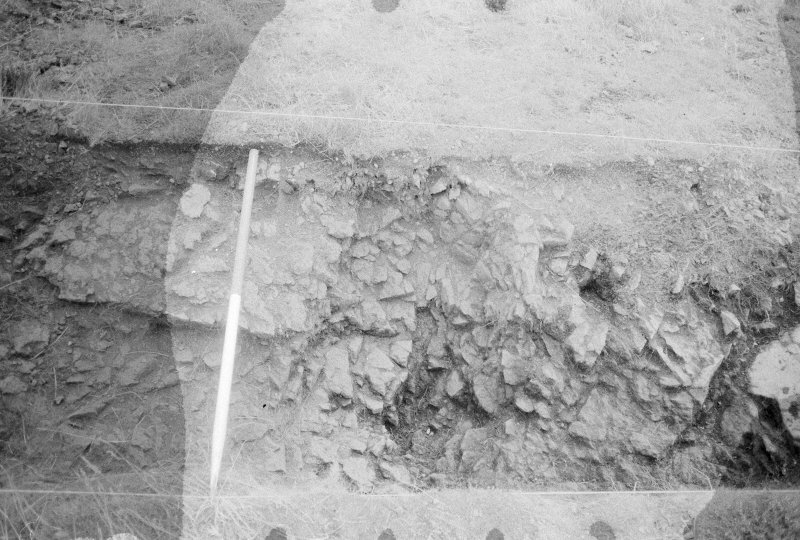 Excavation photograph : area I - final photo of south rampart, from west, without ranging rods. 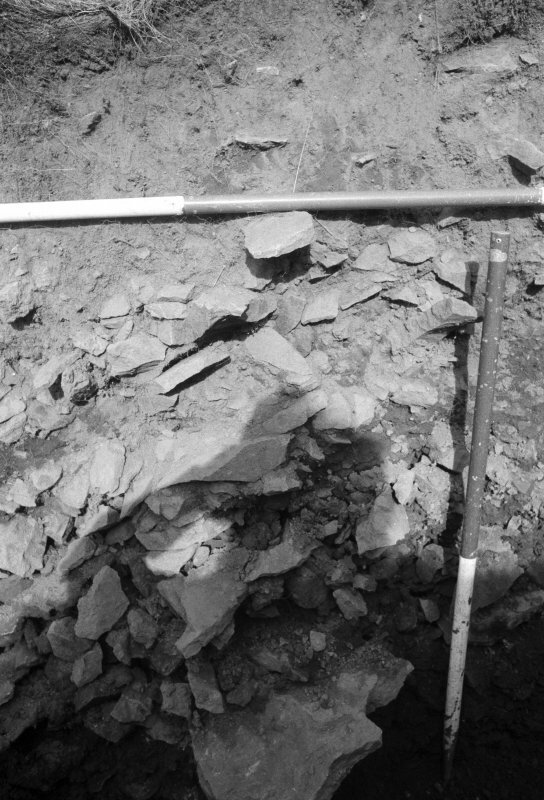 Excavation photograph : area V - bedrock, looking east. 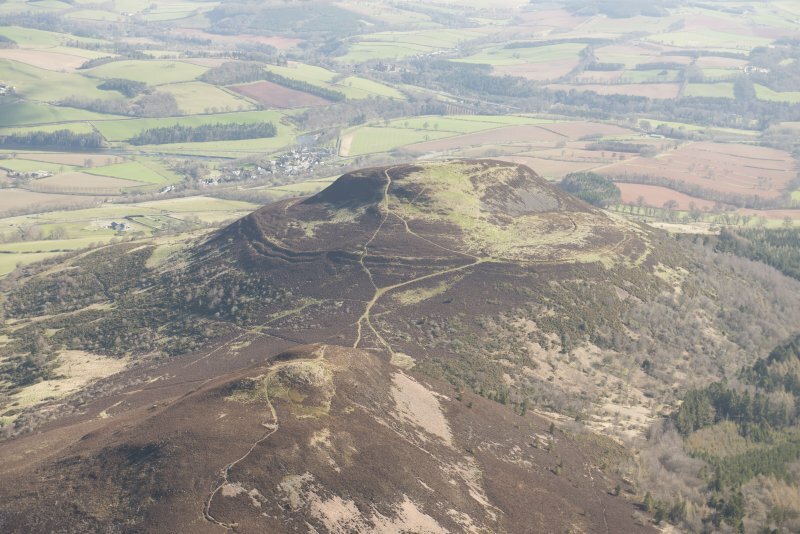 This hill-fort, the largest in Scotland, being 39 acres in extent, occupies the summit of Eildon Hill North, a height of 1385 ft OD. Three phases of development have been distinguished, although the first two are somewhat difficult to trace on the ground. 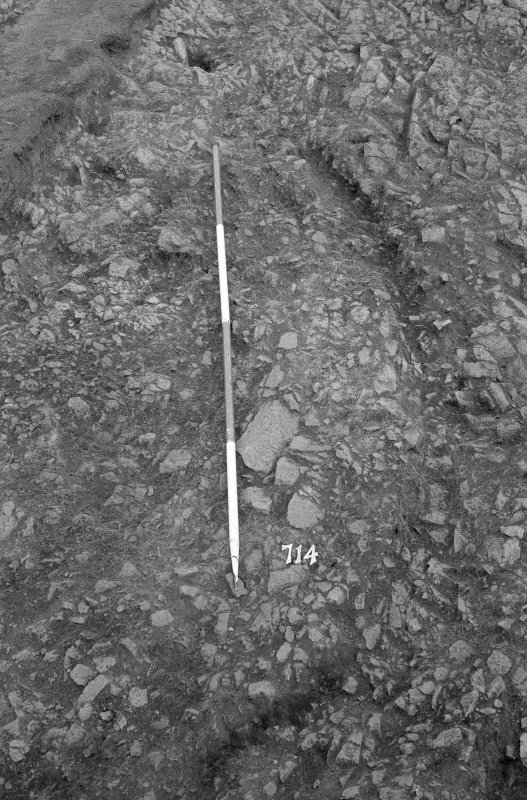 (C on RCAHMS 1956 plan) faint traces of the northern rampart may be seen, but it is much mutilated by later hut floors and on the southern side it is now represented only by a natural scarp. 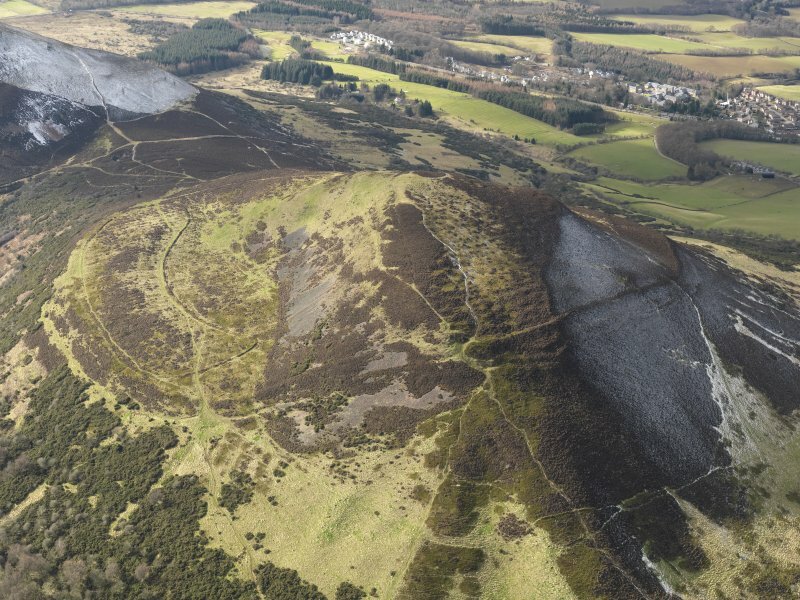 However, the course of this rampart is plainly visible on air photographs (CPE.Scot.315:3184-5). 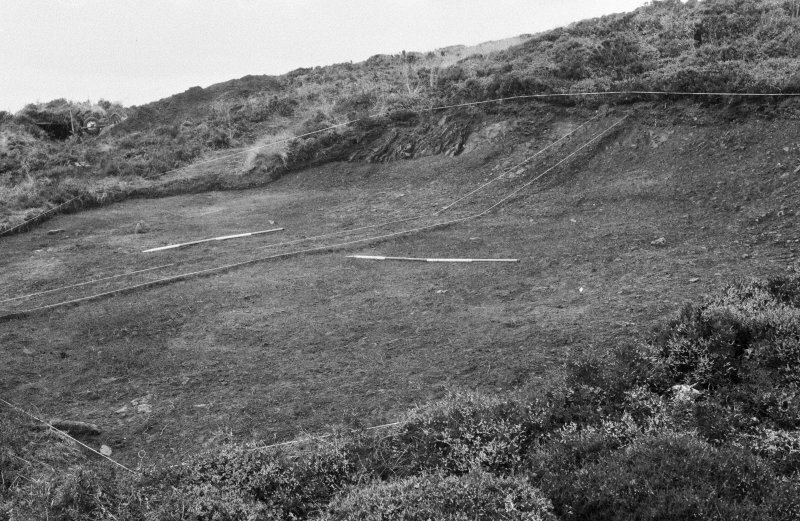 In the second phase (B on plan) the whole of the summit plateau was enclosed; here again the defences are much wasted and are cut in two places by hut floors, but their line may be followed as a terrace on the N, W, and S, and as a slight rampart at the E end of the S side. In the third phase (A on plan) the whole of the hill was enclosed by three ramparts and ditches. These survive mainly as terraces, but enough remains to reveal the plan, especially on the W side, where an internal quarry ditch is also visible. Four original entrances can be seen (at E1, E2, E3 and E4; E5 appears to be a later mutilation). No less than 296 hut floors have been identified within the fort and since most of these owe their survival to the fact that they are scooped out on slopes, the number should perhaps be doubled to allow for the more level areas. This was clearly an oppidum in the full sense of the word, and on the evidence of Ptolemy, this was the chief centre of the Selgovae. 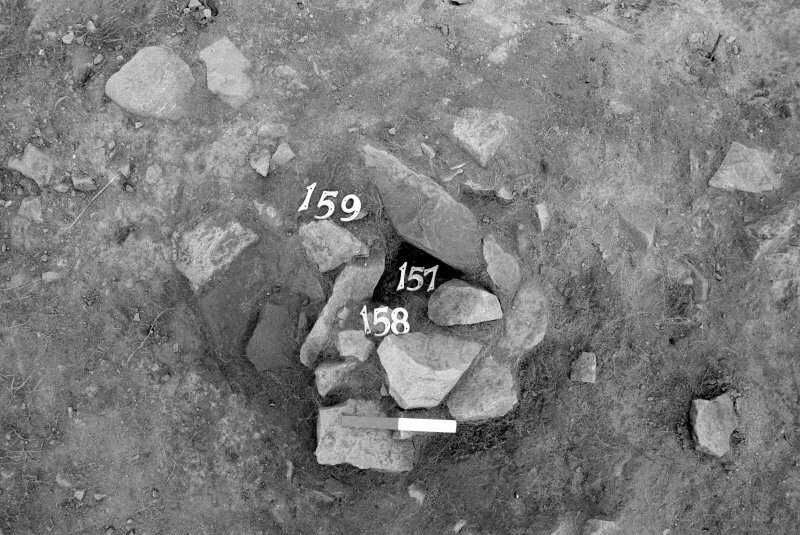 Excavations by Curle (D Christison 1894) in three of the hut floors produced evidence of occupation, including a fragment of native pottery, now lost, but did not throw any light on the structure of the huts. Very few chance finds have been reported from this hill, and none of these can now be traced. They include a denarius of Hadrian, a whetstone, a fragment of native pottery, and several other pieces of pottery "including one of a very fine red clay, glazed on inside, and resembling Samian ware". 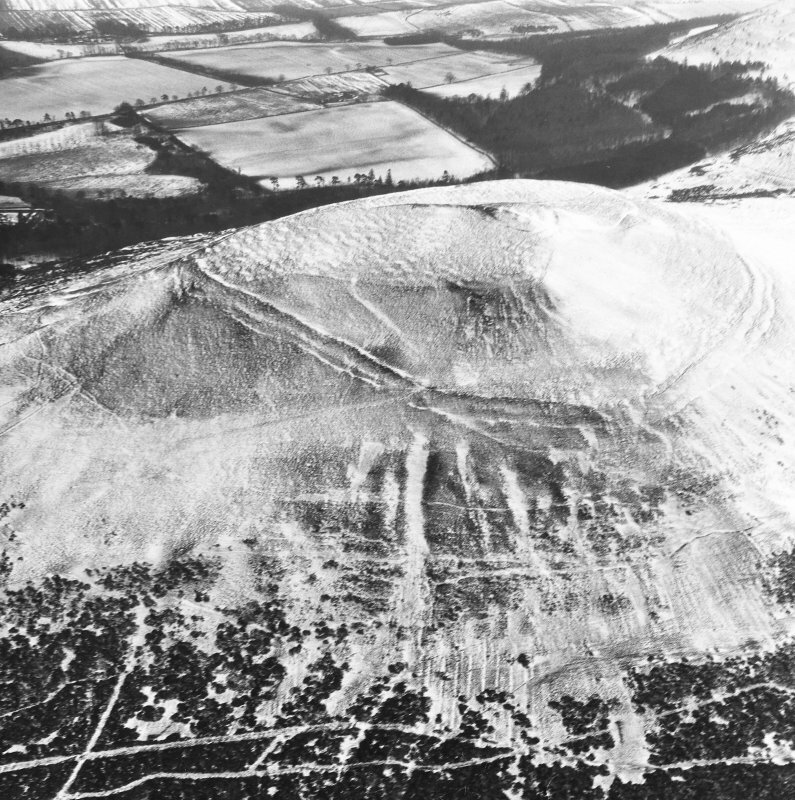 This large hill fort is generally as described above, except that many of the hut floors were difficult to recognise as such owing to denudation and snow on the ground at the time of visit. No definite traces of the first phase fortifications were noted except for a short stretch of wall or rampart at NT 5543 3285. Surface finds from this fort, comprising a whetstone, a broken facetted stone, a shale disc, a stone disc, five sherds of Roman coarse ware. four sherds native ware, an oval bronze ring, and part of a bone pin were donated to the National Museum of Antiquities of Scotland (NMAS) in 1966-7. The Roman material is listed by Robertson either as of unknown date or dating to between the 2nd and 4th centuries AD. 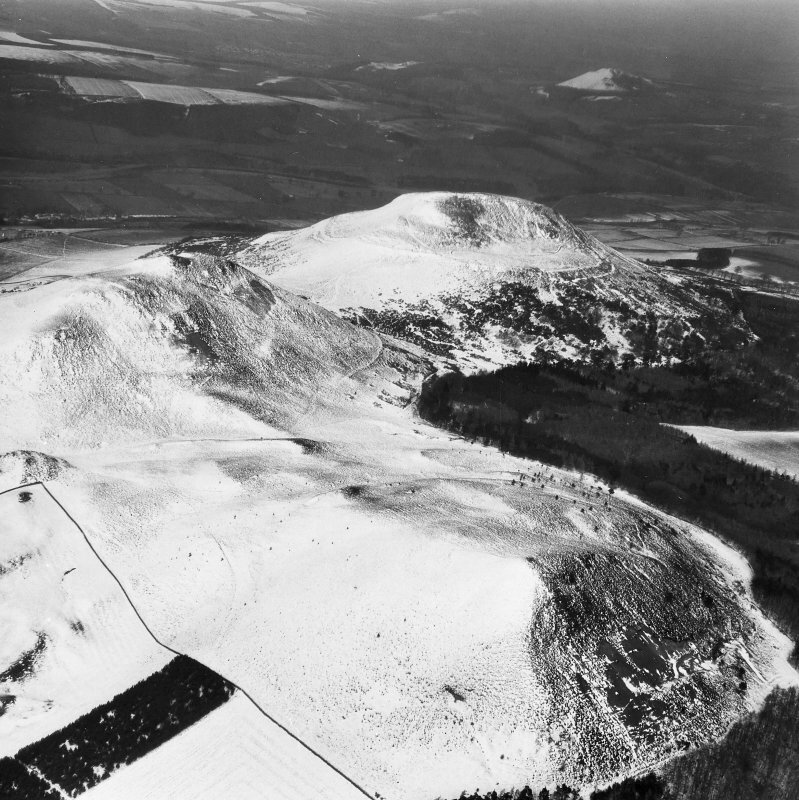 Hill-fort photographed by the RCAHMS in 1976 and 1980. (1) Entrance 2, through inner circuit of defensive system A. THe ramparts on either side of the entrance were much degraded. They were built wherever possible along the top edge of natural rock scarps. 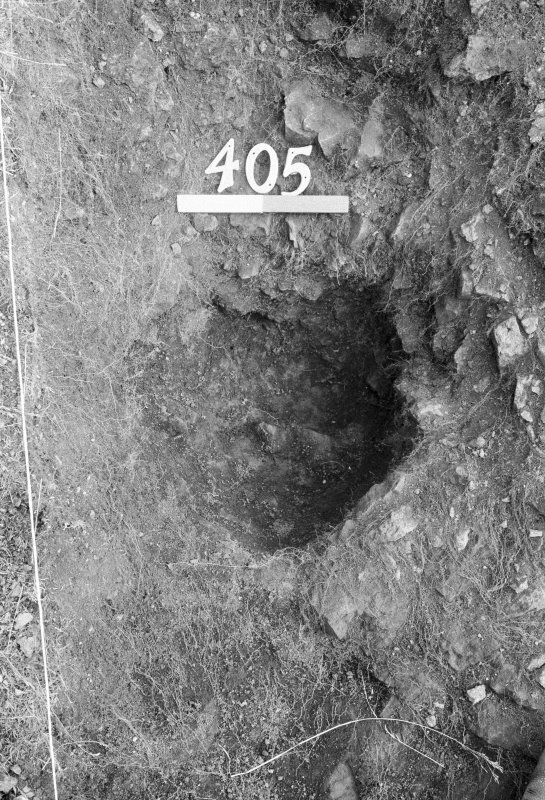 Their construction was variable in character but generally, deep, rock-cut postholes defined their limits while their core comprised soil and rubble, roughly faced in places with larger stones at foundation level. Rock-cut slots marked the position of probably double gates. 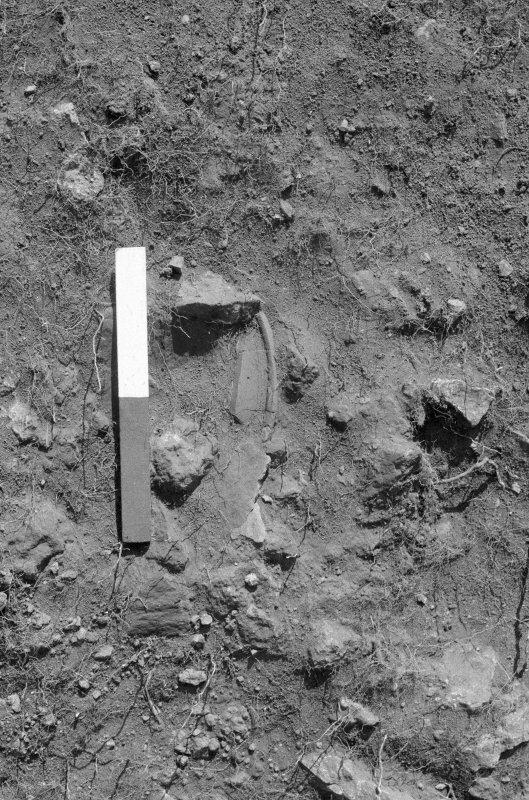 The surface of the track through the entrance was bedrock, and unmetalled. No traces were found either of structures or activities immediately within the entrance. A quarry pit was located immediately inside rampart A. 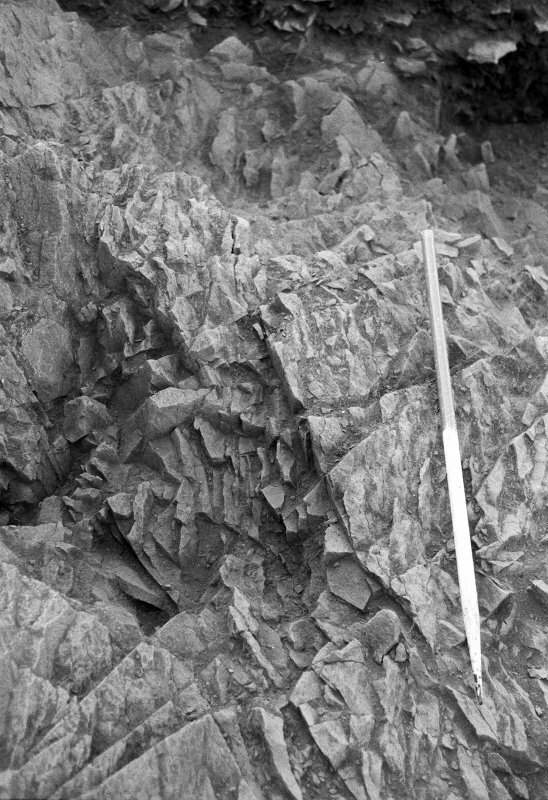 (2) A two-phase, rock-cut platform within rampart A. In both cases the rock was cut at the back of the platform and the quarried material was used to level up the front of the platform. In the early phase, two occupation levels containing much pot including one complete cooking pot were found, but no hearth. In the later phase, on the surface of the stone-packed trampled floor, there was evidence of bronze-working. there were no structural remains associated with either phase, apart from the cut platforms themselves. (3) A trench across rampart A and into the interior of a hut platform backed against it. The rampart construction resembled that at entrance 2, but was relatively insubstancial. The hut platform postdated the rampart. One relatively thick occupation level was discerned. 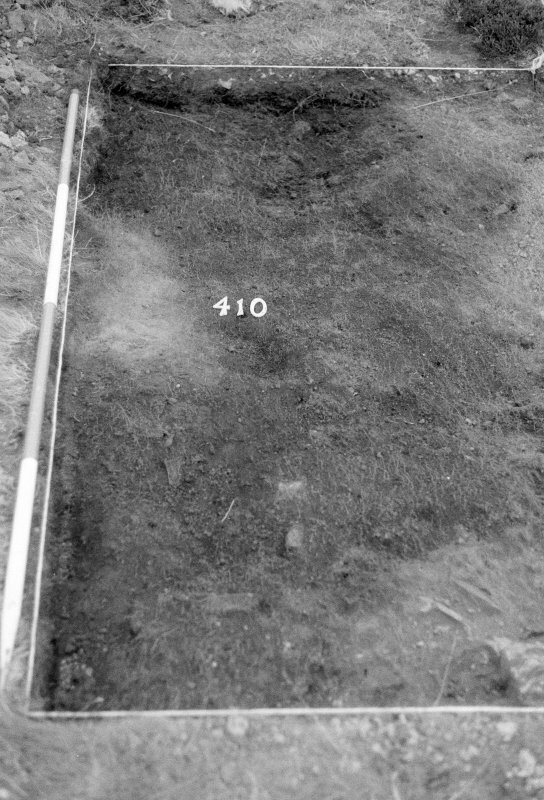 (4) Long trial trench to establish existence of defensive system C. Only one rock-cut posthole was found, and this may have been associated with an adjacent hut platform. 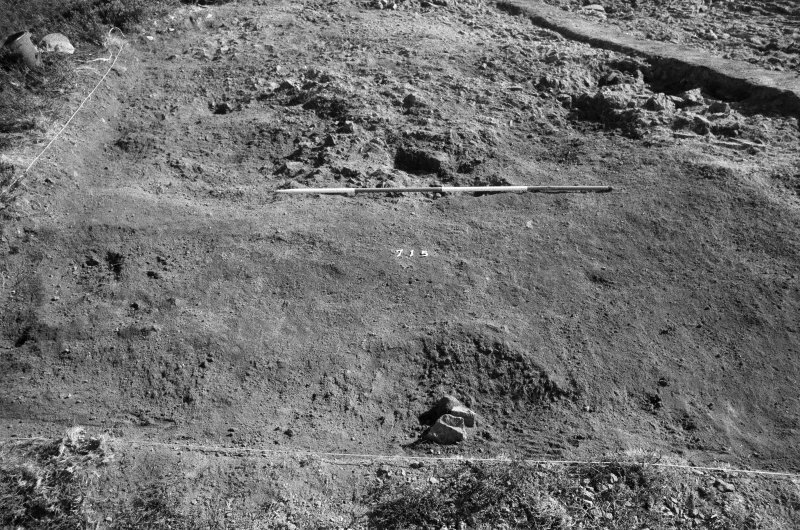 (5) Trench across site of defensive system C. A discontinuous shallow slot of rectangular section provided inconclusive evidence of a palisade trench. (6) Trench across site of defensive system B. No construction was found. 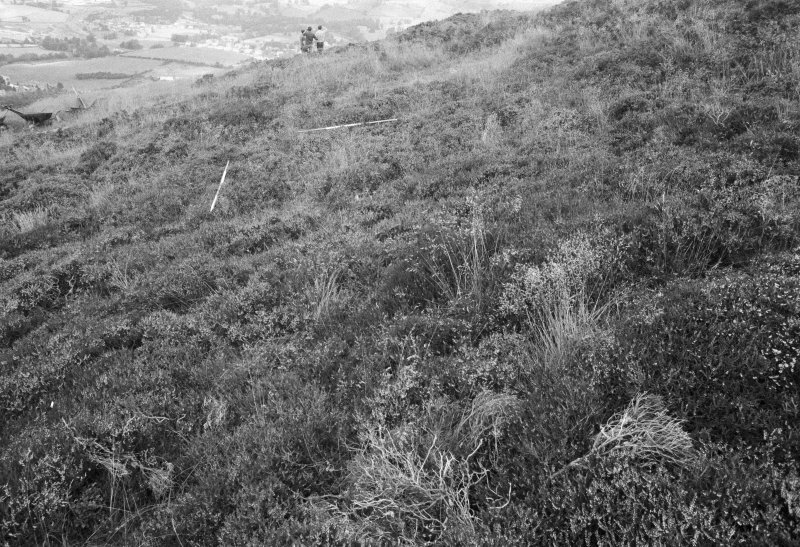 A steep scarp formed a natural line of defence, made more pronounced, by the presence of a sheep track along the top edge. A fragment of a wasted rampart occurs where the scarp was less steep, SE of area 6. (7) Hut platform within defensive system C. The platform was levelled up at the front with gravel, backed against gently sloping bedrock. Traces of a curvilinear slot were found round the back of the platform. No occupation level survived, but finds of pot, industrial waste and flint flakes were made, and there were scanty traces of a hearth. A small assemblage of Roman artefacts was retrieved during the work, but in every case, Roman material overlay Native occupation. Sponsor: SDD-HBM-CEU, University of Durham. Like Traprain in its prime, this fortified British town covered some 16 ha, and the ramparts are visible from a considerable distance. Its latest feature is not native however, but Roman: a circular 10.7m enclosure surrounded by a ditch crossed by a causeway on the north side. Inside stood a rectangular wooden signal tower, probably two storeys high, on six posts. It was a late 1st century AD signal tower, presumably part of Agricola's defences, and visible for some 24-32km except to the south-west (Oakwood Fort, no. 79). 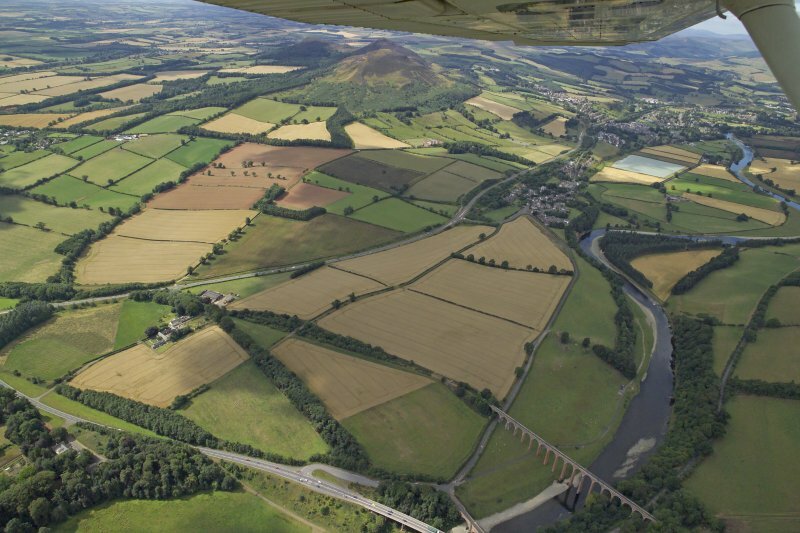 At about 305m Eildon Hill North dominates routes along both the Tweed and the Leader Water, as well as fords on the Tweed both north and east. 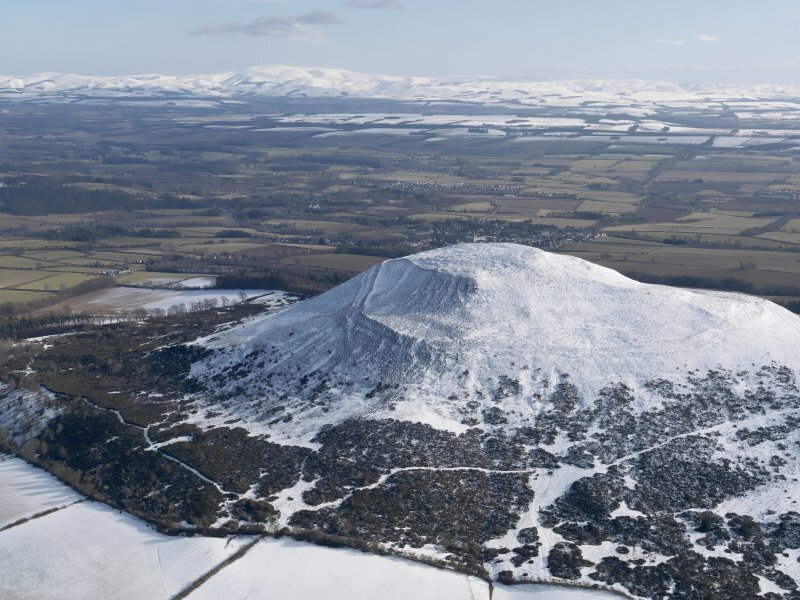 It commands the whole of the Merse and is clearly seen from suitable vantage points on the Cheviots. 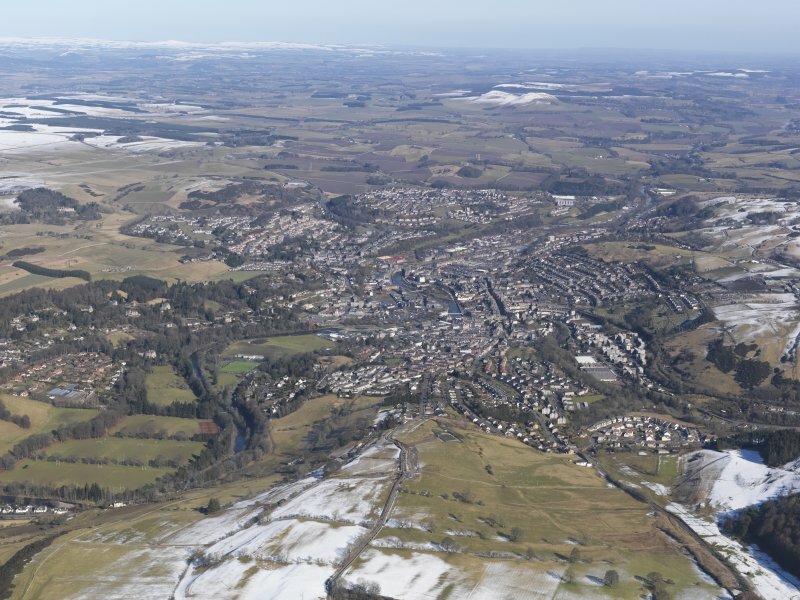 Clearly it served the massive Newstead complex, receiving and transmitting long-range messages, and was likely the key Roman communications centre in south-east Scotland. Like Woden Law (no. 83) it was doubtless too important to the Romans to be left in the hands of the natives. The first phases of native settlement are barely evident: a single wall or rampart around the summit enclosing some 3.6 ha. In its last, most visible phase, however, the fort possessed three concentric ramparts over 1.6km in circumference, though in places one or sometimes both of the outer lines have since slipped down the hillside. For the most part these ramparts now appear as terraces, which may have been deliberately built as foundations for the ramparts-as also on Wo den Law. Spread over the surface of the fort are some 300 hut circles: level platforms scooped out of the hill, on which timber-framed houses were built. Their number suggests a population of perhaps 2000; or 125 people to the hectare. Under these circumstances, and assuming the town to have been permanently occupied, the community could not have been self-sufficient. Society was presumably highly organised, stratified and involved in trade and localised industry in addition to agriculture. 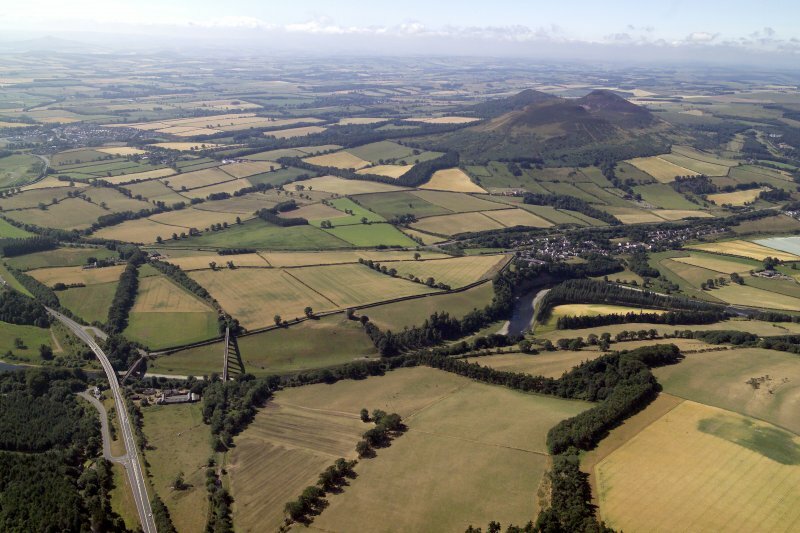 Eildon Hill North is thought to have been the capital of the Selgovae who lived around the Upper Tweed and had smaller 'towns' on Ruberslaw (no. 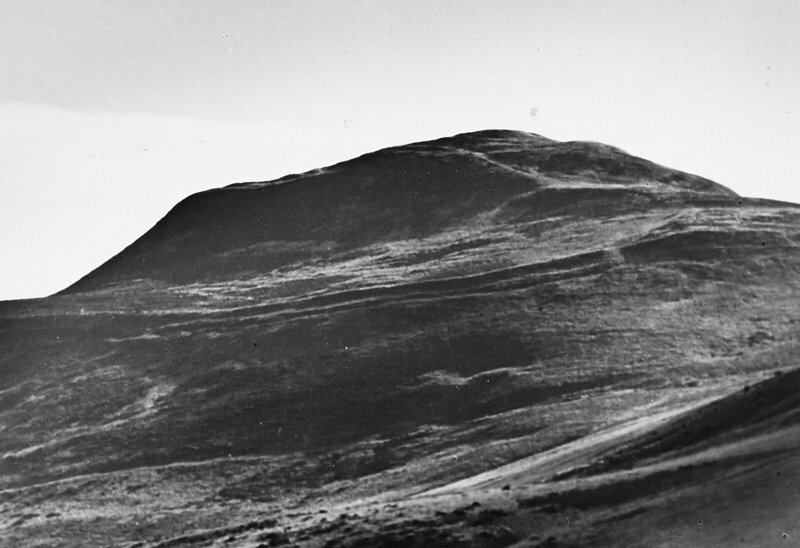 85), White Meldon (NT 219427) and Dunion Hill (NT 625190). 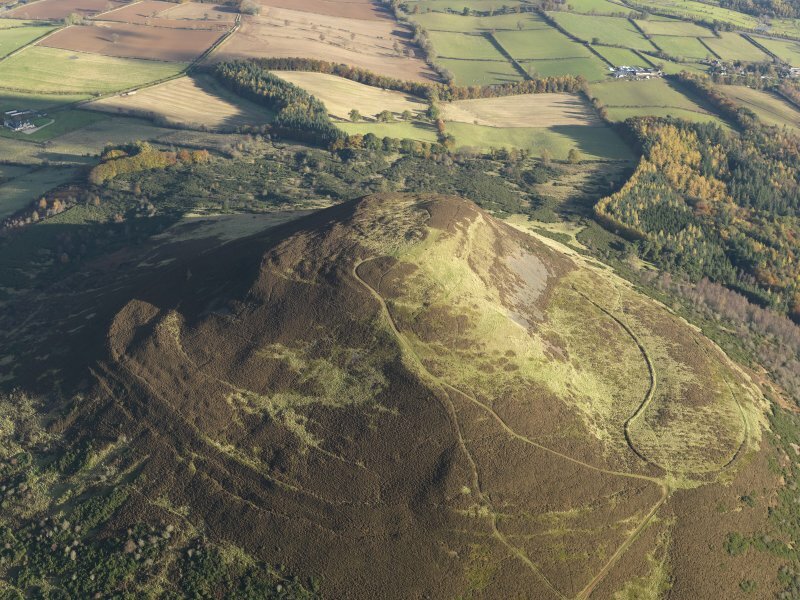 Eildon Hill North, the easternmost of the three summits of the Eildon Hills has long been known as the site of one of the largest fortifications in Scotland. At least two circuits of defences can be distinguished, the inner enclosing the plateau that slopes down E from the summit of the hill, and the outer contouring along a shoulder lower down the slope, but climbing up on the E to ride over the E end of the plateau. The outer, comprising three ramparts for much of the circuit, though in places they are reduced to little more than terraces and only two can be detected, encloses 15.5ha, while the inner enclosing the plateau, its perimeter little more than an intermittent terrace about 2.4m wide, takes in 3.2ha. 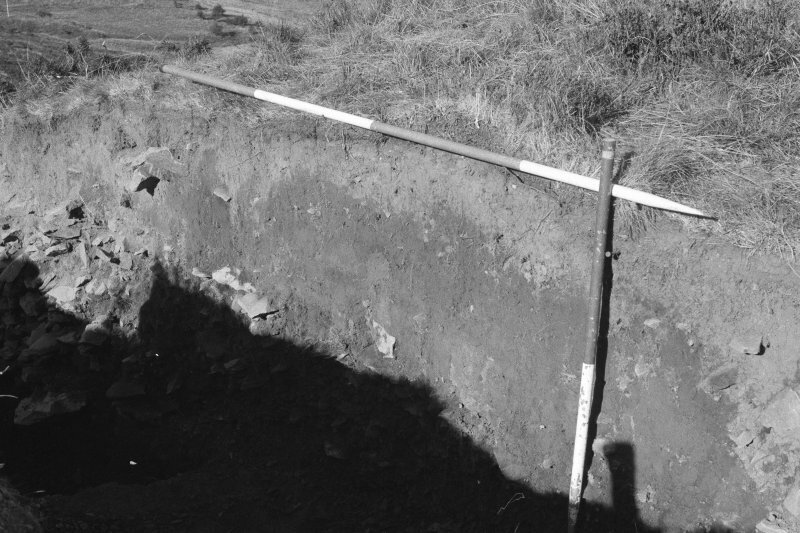 No trace of a possible third circuit identified by RCAHMS investigators beneath the house platforms that pack the upper plateau was located when two evaluation trenches were excavated across its line in 1986 (Owen 1992). Five gaps can be seen in the outer belt, of which those on the E, ESE, SW, and WSW are probably original entrances, whereas that on the NNE is pierced obliquely by an engineered trackway and may be relatively recent. The chronology and sequence between the two schemes , however, is uncertain. 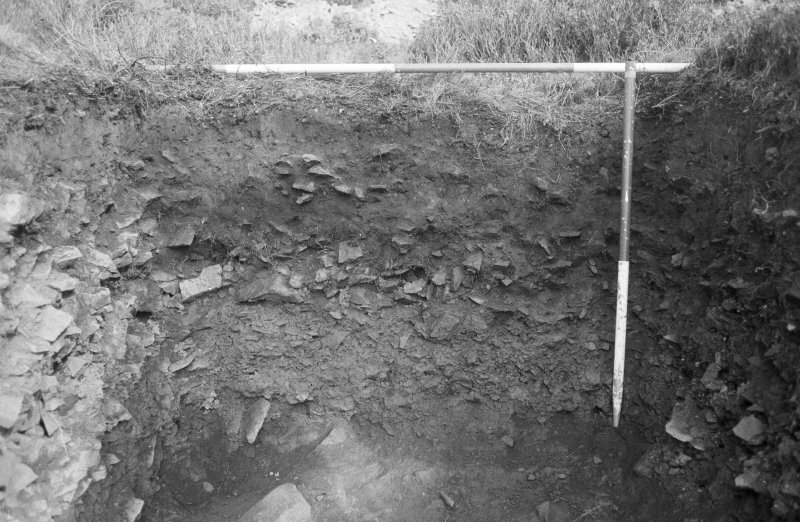 An evaluation of the inner rampart of the outer belt in 1986 (Owen 1992) at the entrance on the SW uncovered a Late Bronze Age hearth beneath it, but was unable to date the rampart itself. 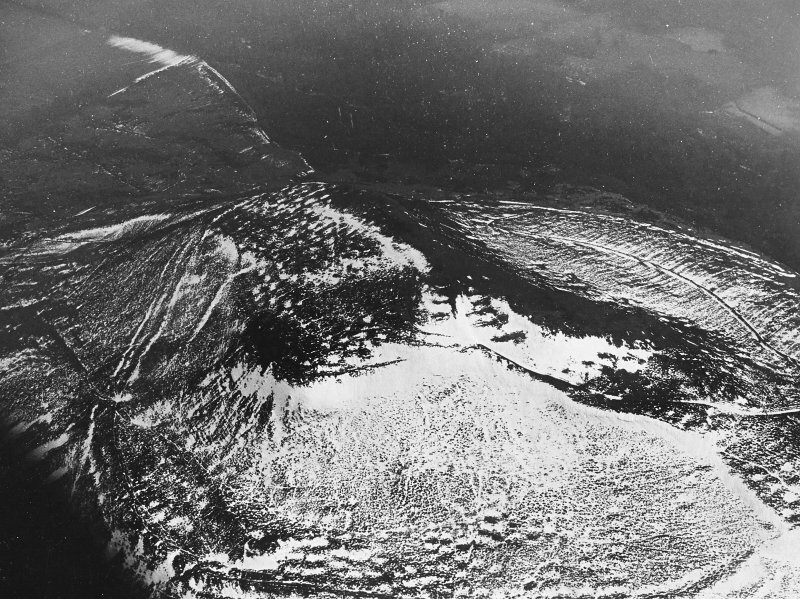 Furthermore the ramparts below it were not excavated and their relationship to the inner rests on the assumption that the concentric belt recorded by survey is a single contemporary entity. Doubts about the wisdom of this assumption arise on the E, where the belt of ramparts climbs up to the E end of the upper plateau. 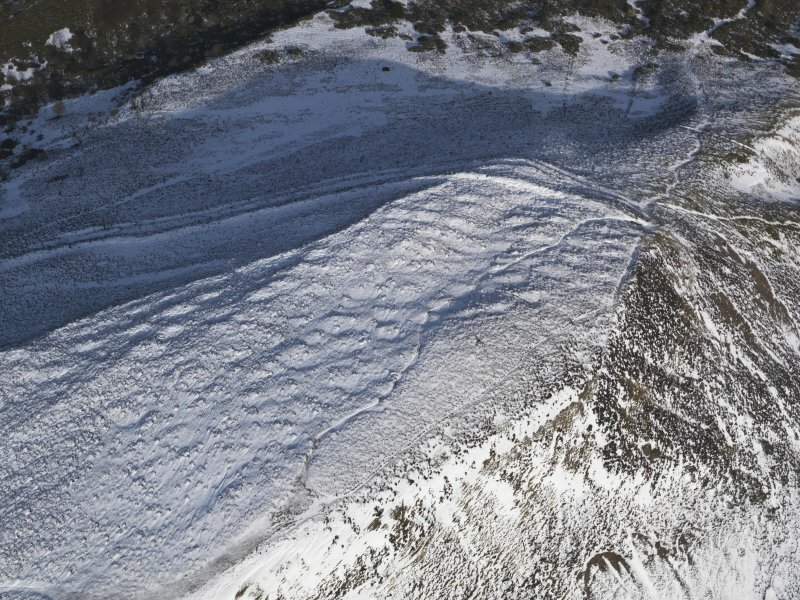 Aerial photographs of this intersection taken under snow in 2010 suggest that whereas the inner rampart climbs straight over the top of the plateau perimeter, the outer ones divert around its foot. The relationship is on the one hand clear-cut, and on the other ambiguous, but at the very least implies that the inner rampart in its present form post-dates the plateau fortification, blocking an earlier entrance in the latter's E end; more tentatively, it might be contended that the outer belt of defences incorporates two separate elements with a much wider chronology. 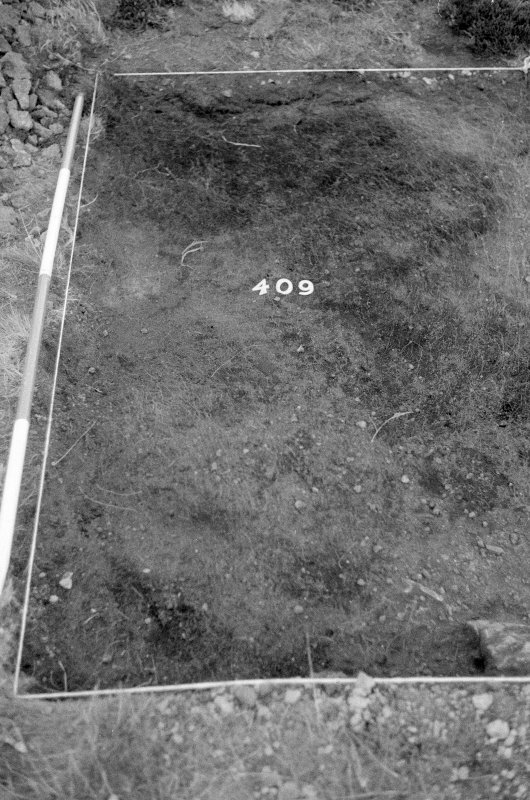 If this is the case it might go some way to explaining the very wide range of dates recovered from the excavation on the SW in 1986 of three of the numerous platforms that are visible along the lower slopes below the plateau. 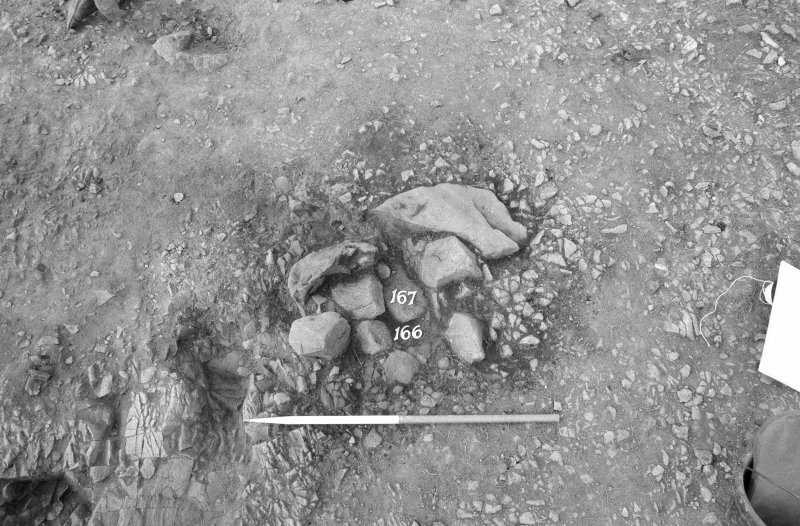 Two returned Late Bronze Age radiocarbon dates, while a second occupation on one of them, and on a third adjacent, were firmly dated to the Roman Iron Age. The artefact assemblages recovered in 1986 broadly reflect this same pattern, earlier items including a bronze chisel or punch and evidence of bronze metallurgy, the later two fibula, a glass bead, glass armlets iron metallurgy and Roman pottery. 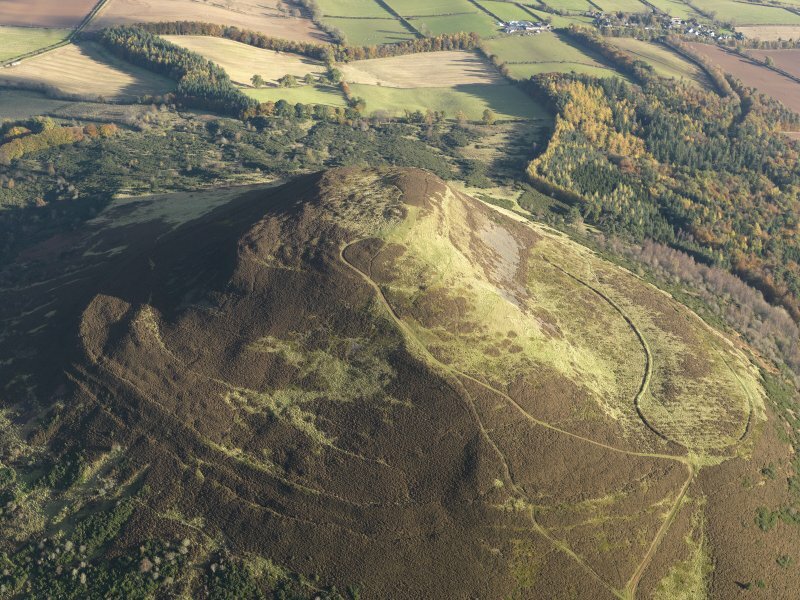 The largest hillfort in Scotland, and the most widely visible landmark in the Borders – Eildon North Hill, located just south of Melrose, has always been a beacon in its own right. The Roman army stationed here made this literal. Their garrison at ‘Trimontium’ (after the three Eildon hills), Newstead, placed a lookout and signal station on Eildon North Hill. 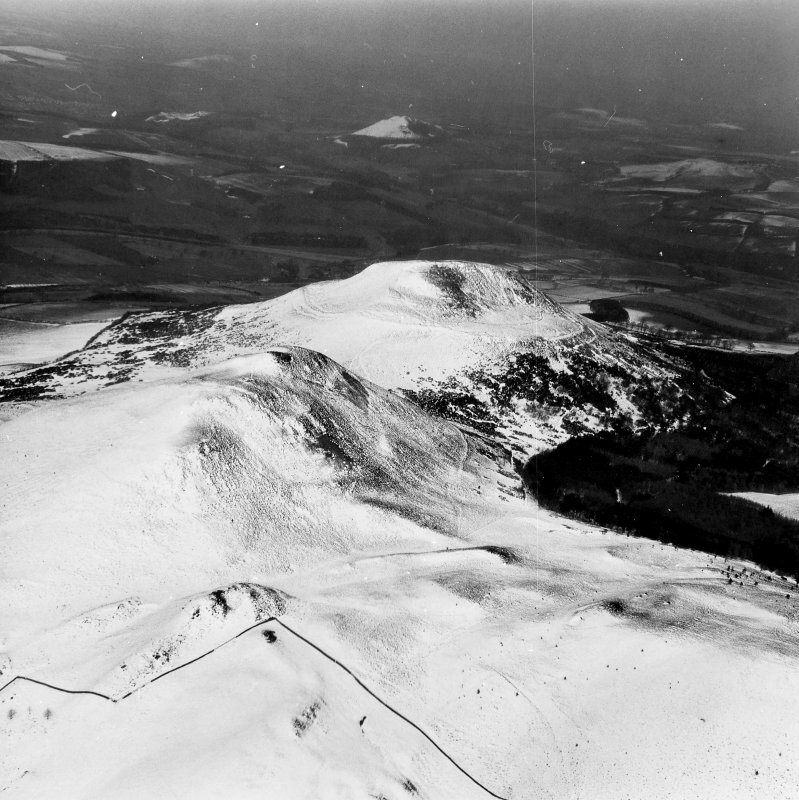 This connected with a fire chain stretching from Northumberland northwards to the Forth, and included lookouts on prominent hills such as on Brownhart Law in the Cheviots, that could warn the occupying army of an impending attack. 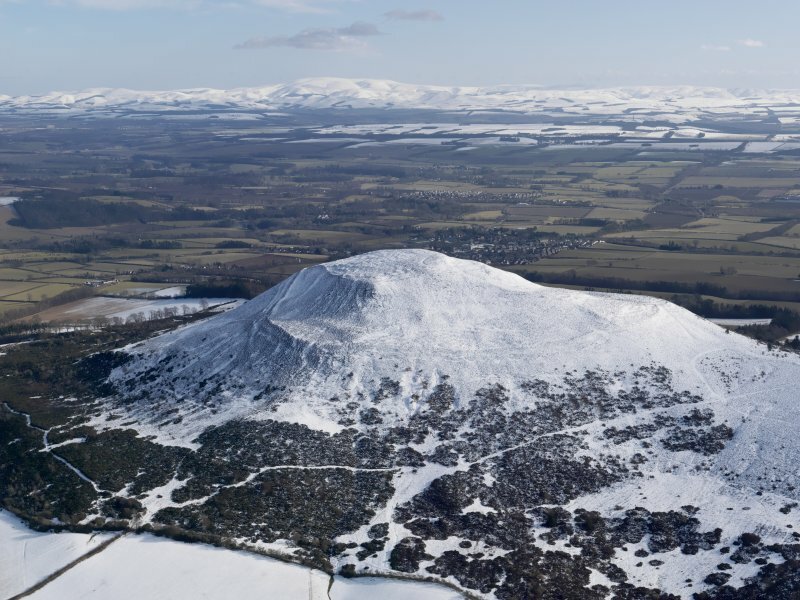 This was a frontier in its own right and the Iron Age and Roman archaeology of the area speaks volumes about the everyday complex relationships that emerged during the imperial occupation of southern Scotland. 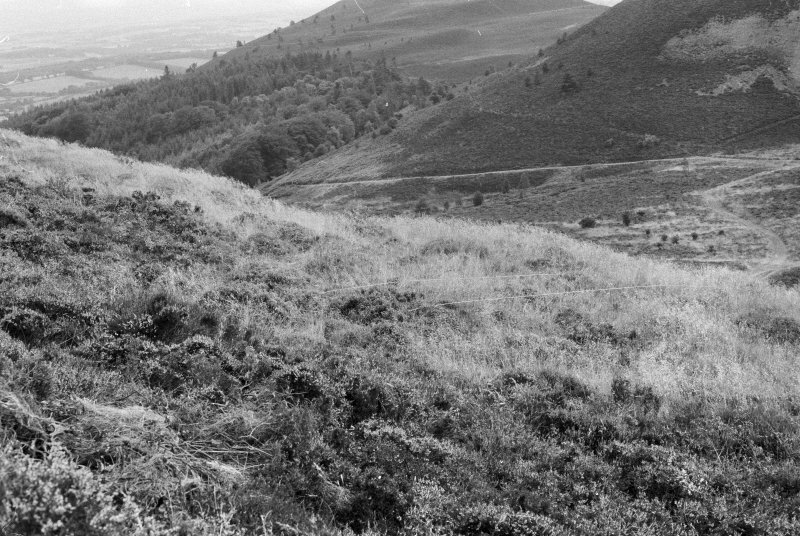 To this day, the enormous, nearly 1 mile long, enclosing defences on Eildon North Hill slide along its flanks like a coiled serpent. On a frosty day, drivers on the A68 or Melrose Bypass might also see the pockmarks from hundreds of roundhouse platforms. Impressive as this site is now, the Romans were surely stunned by its magnitude. 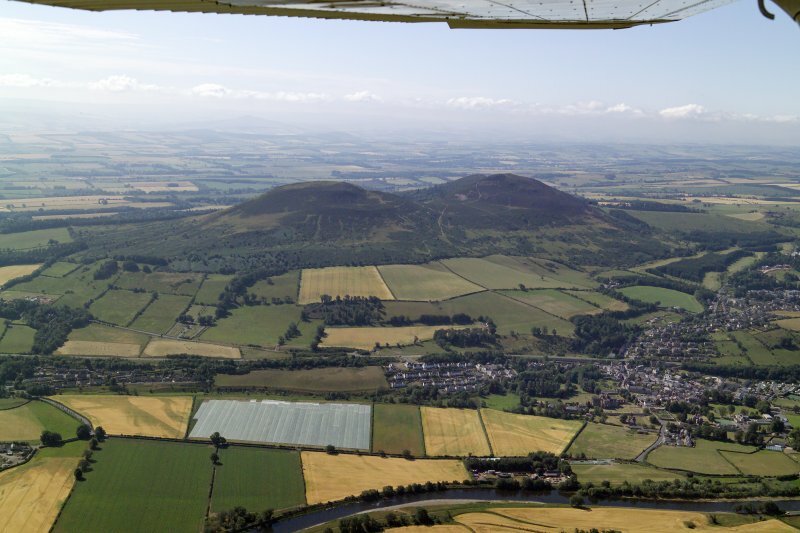 It is perhaps no coincidence that the first Agricolan period camps were established at the foot of the hill in the 80s AD, and that these marked the beginnings of the fort that took its name from the three peaks of the Eildons: Trimontium. 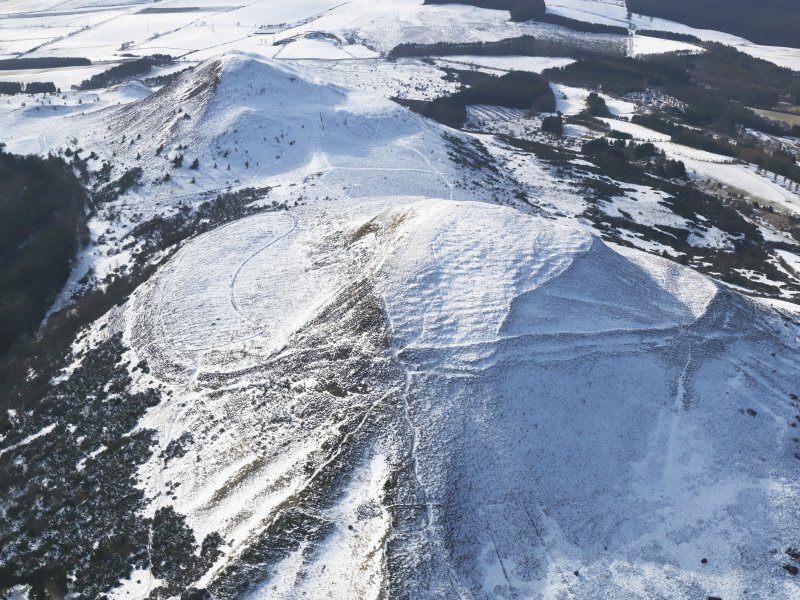 Except, by the time the Roman military machine trundled through the Borders, Eildon North Hill seems to have been abandoned. 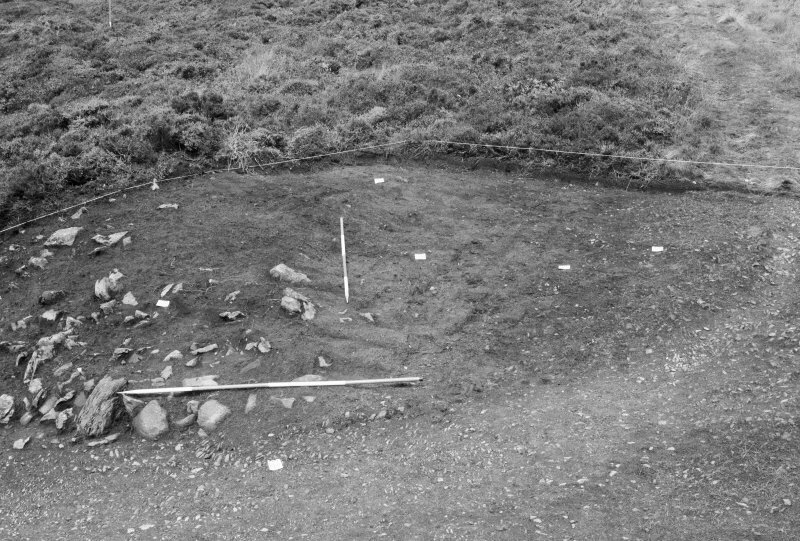 While it is recorded that James Curle made a few exploratory excavations of hut circles in the 1890s, the only published excavations are those of Steer and Feachem (1954) and the Central Excavation Unit Scotland in 1986. 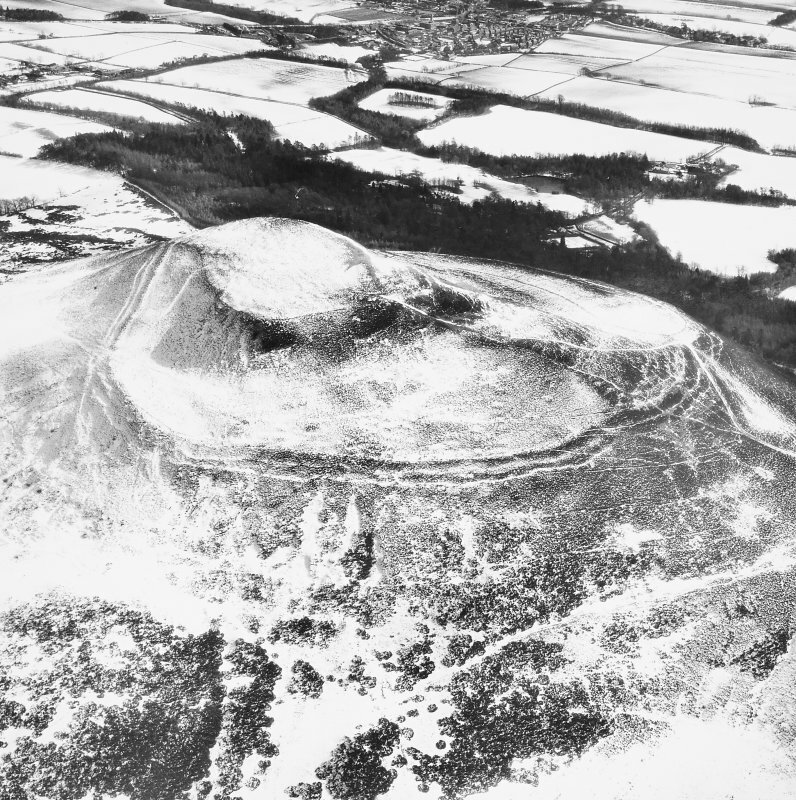 Both the 1952-53 and 1986 excavations confirmed that the main occupation of the hill took place before the construction of a Roman signal station on the hill’s summit. This consisted of a wooden tower surrounded by a circular bank and ditch. 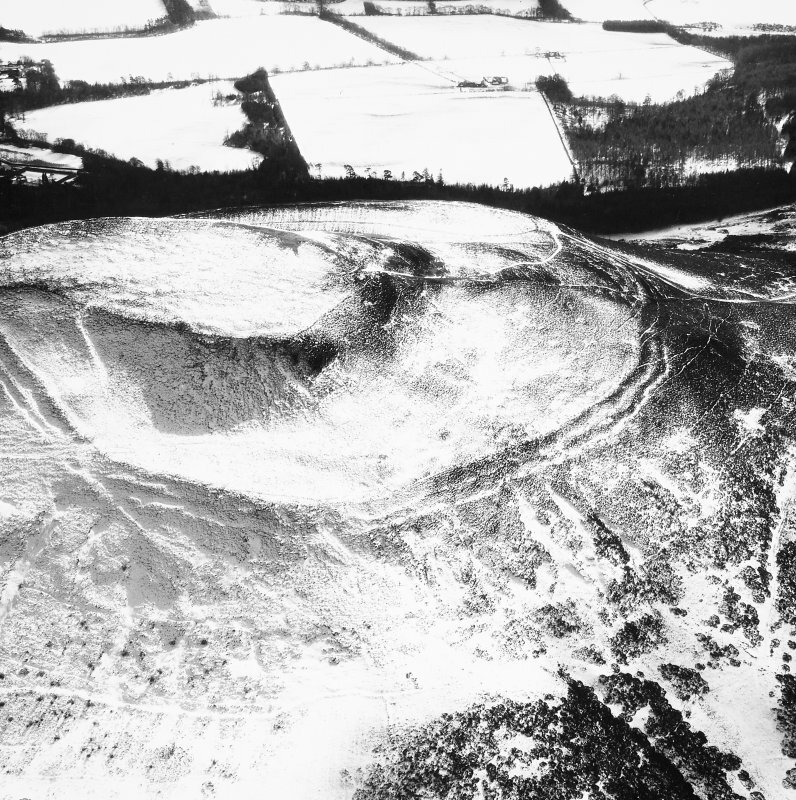 Radiocarbon samples taken in 1986 indicated the hillfort had a long life between the later Bronze Age and the middle of the Iron Age. These, along with Roman pottery, were of second century AD date, contemporary with the main occupation of the fort at Newstead. 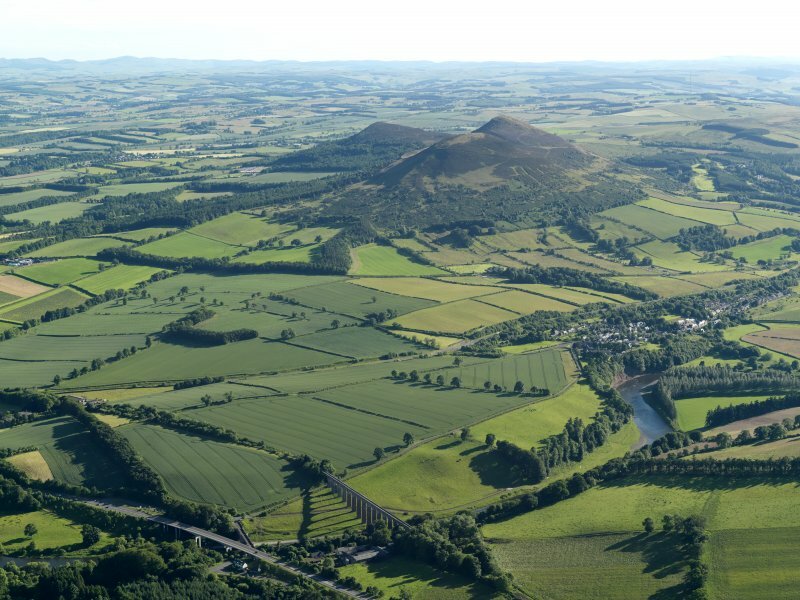 Whoever the Romans were watching out for, it was not any residents of Eildon North Hill. And yet, we are left with evidence suggesting the very limited excavations on the hill have only scratched the surface of the story. There is, for instance, some late third or fourth century Roman pottery from the hill which must have come to the site after the Roman fort below was abandoned. 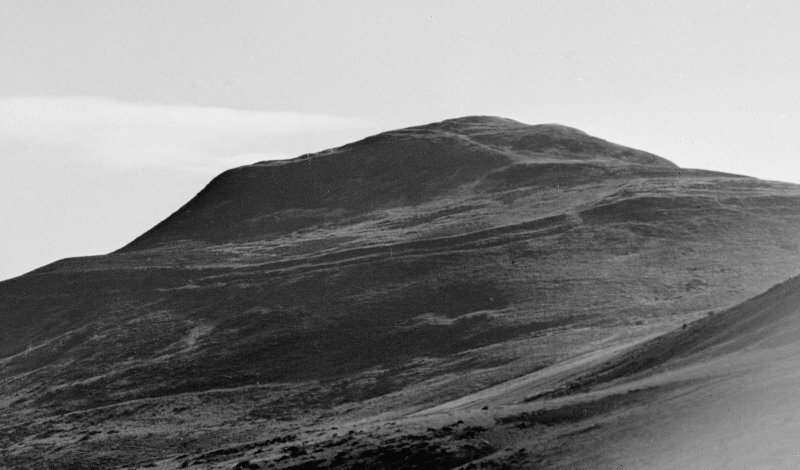 Is there, somewhere on the hill, evidence for later occupation similar to that at Traprain Law in East Lothian? Only time will tell. 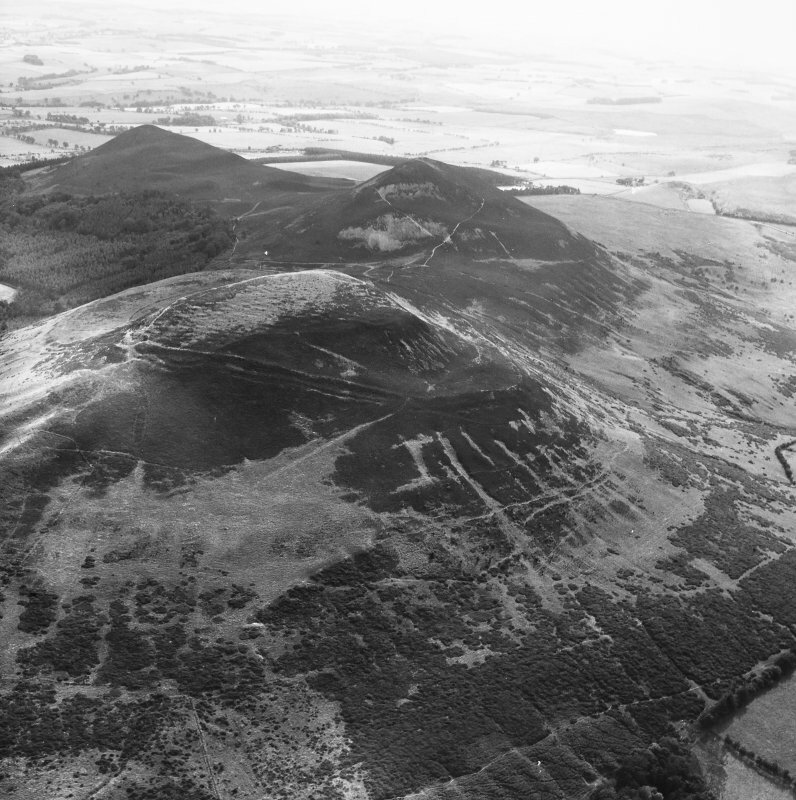 Nonetheless the name of the Eildons may derive from the Anglian AEled Dun meaning ‘fire hill’ recalling the signal station (Steer and Feachem 1954). 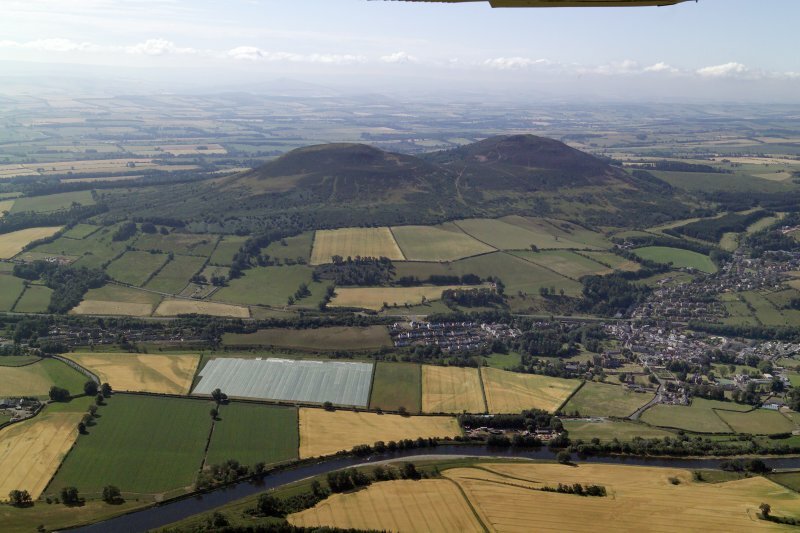 The Roman signal station on Eildon North Hill was one in a chain that formed an effective frontier running north to south and separating the Southern Uplands from the fertile plains of the Merse and the lower Tweed Valley. The signal stations were supplemented along the course of Dere Street by watch-towers. In form, these were similar Eildon North Hill with a wooden tower set within a sub-circular bank and ditch. A well-preserved example can be visited on Brownhart Law on the English Border about a mile north-east of the Roman fort at Chew Green and just south of the hillfort on Woden Law. Brownhart Law watched Dere Street at a key point where the road passed from the open views of the Merse into the hilly and treacherous expanse of the Cheviot Hills. 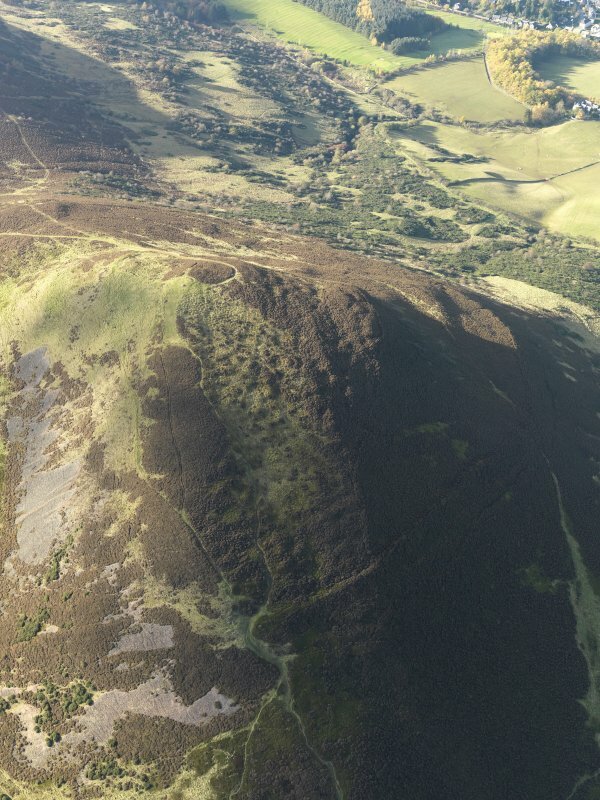 Brownhart Law may have communicated directly with a possible Roman station on Rubers Law which could signal to Eildon North Hill. This chain linked the soldiers of Chew Green with those at Newstead. However, as anyone visiting Brownhart Law, Rubers Law or Eildon North Hill might appreciate, it would have been in any attackers’ interest to make their move on a not infrequent windy or cloudy day. 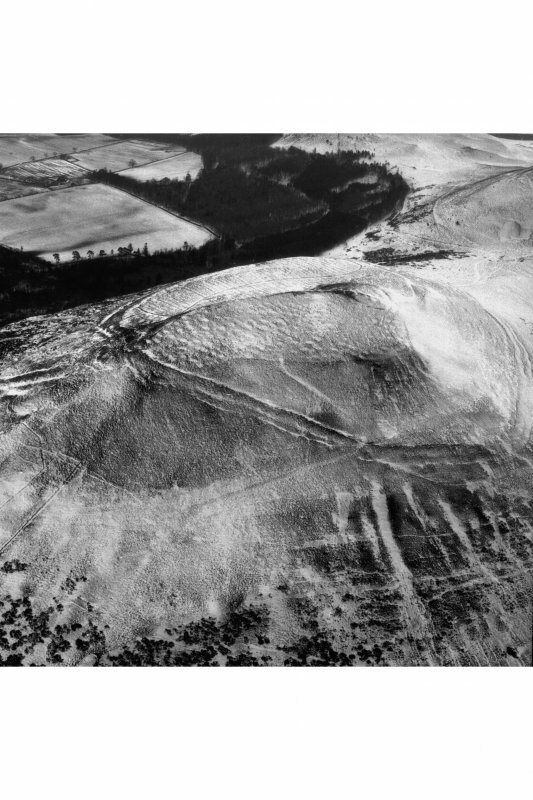 From Brownhart Law, looking down on a wealth of abandoned and perhaps contemporary Iron Age strongholds in the Cheviot foothills, we get a visceral sense of the Roman army’s preparedness and exposure in a foreign landscape. This sense of constant watchfulness and tension must have taken its toll on the men, potentially feeling exposed in a foreign land. 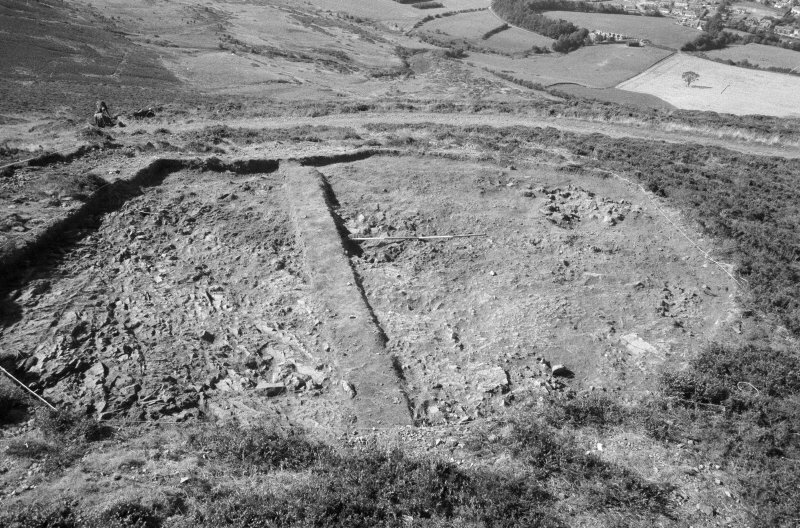 While we generally accept that the Romans and Iron Age Britons of south-east Scotland lived a somewhat peaceful co-existence through treaty or even bribe, the archaeology of the Roman military remains and dis-used Iron Age forts speaks volumes about an inherent tension in relations. 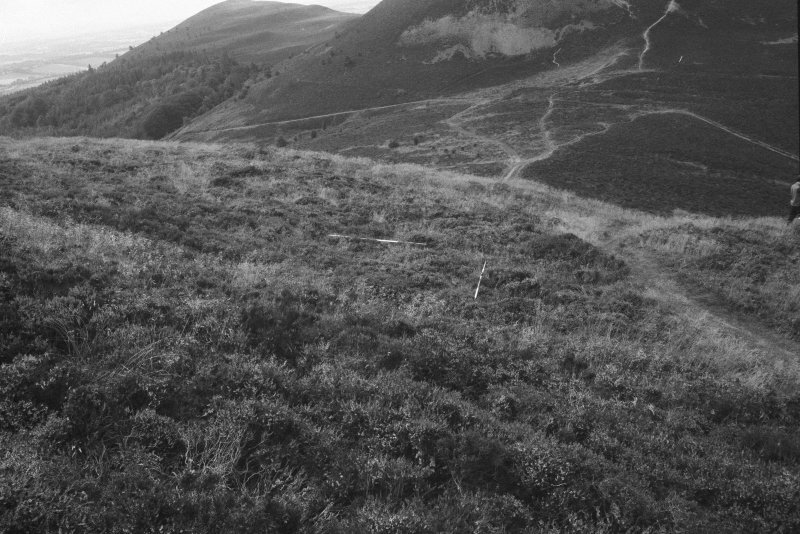 While it was abandoned for some time before the Romans arrived, the ruins of Eildon North Hill must have remained in the hearts and minds of the local people as a special, even sacred, place. 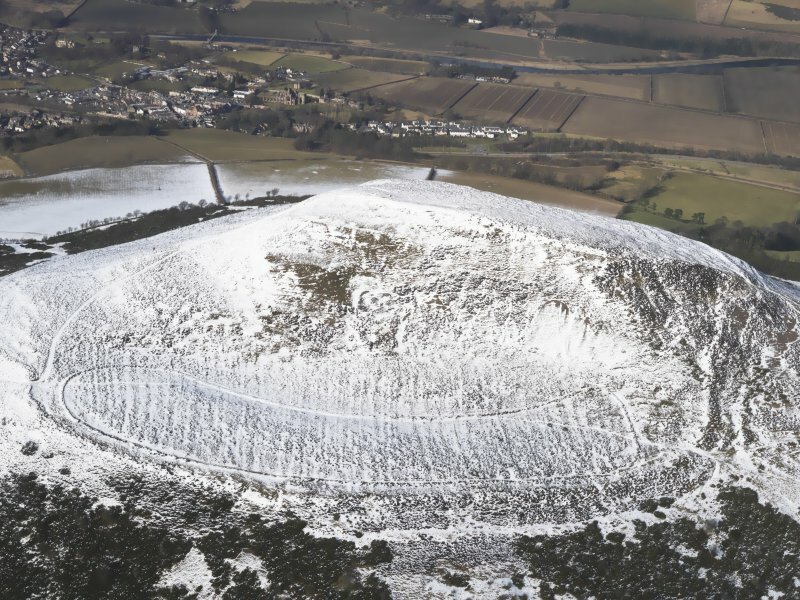 For the Romans to camp underneath and place a station on the hill’s summit, the locals must have been ambivalent at best about the implications. And for the Romans, with their chain of sites spanning the line of Dere Street, their watchfulness implies not just preparedness for any eventuality, but even fear that they were exposed and certainly not in completely friendly territory. None of this story could be told without the visibility of the sites on the ground which led to their eventual excavation. 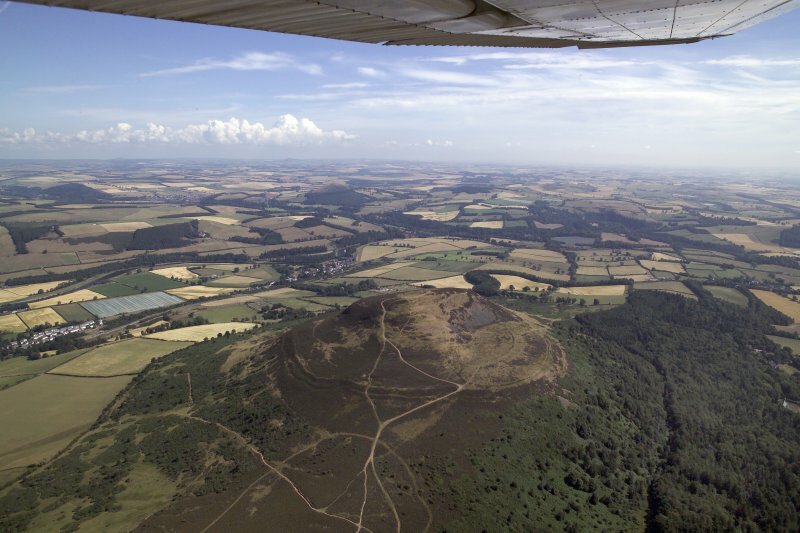 The archaeological sites on Eildon North Hill and Brownhart Law are incredible survivals. 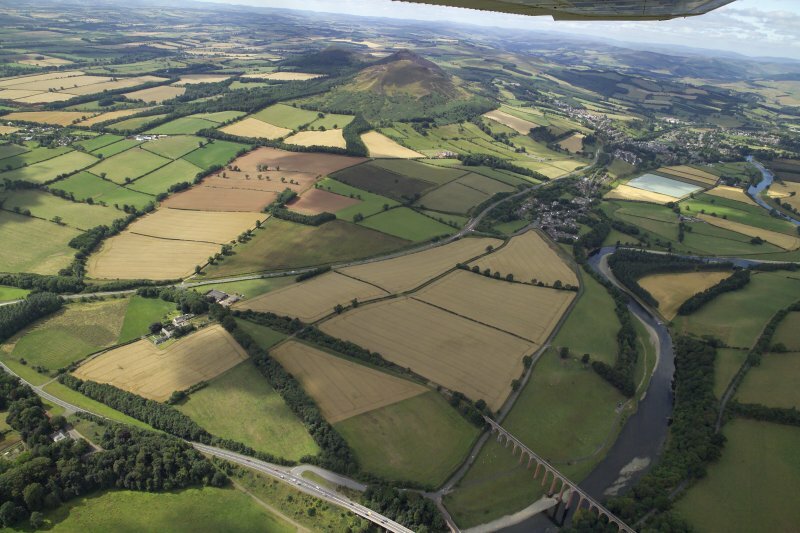 We are fortunate in the Scottish Borders to have so many examples of well-preserved sites from all periods. We would recommend anyone interested in Scottish archaeology to make the journey. Owen, O. 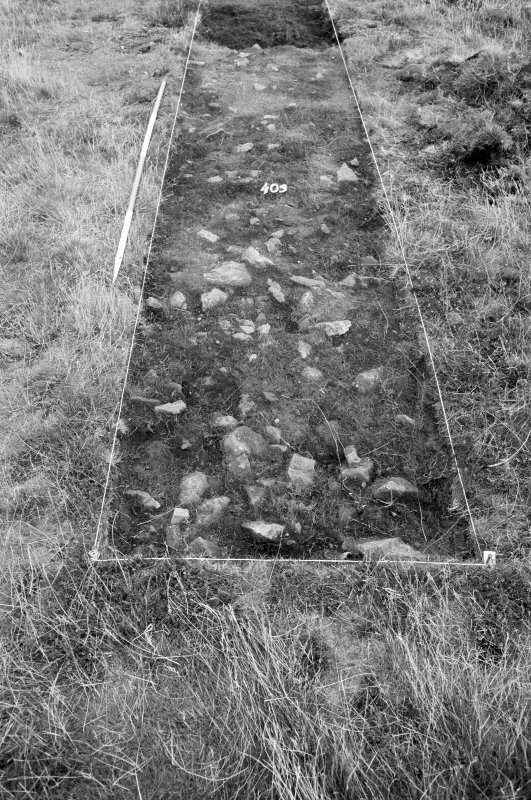 (1987a) Trial Excavations at Eildon Hill North, Roxburghshire, 1986', Univ Durham Newcastle upon Tyne Archaeol Rep, vol. 10, 1987. Rideout, Owen and Halpin, J S, O A and E. (1992) Hillforts of southern Scotland, Monograph 1. Edinburgh. 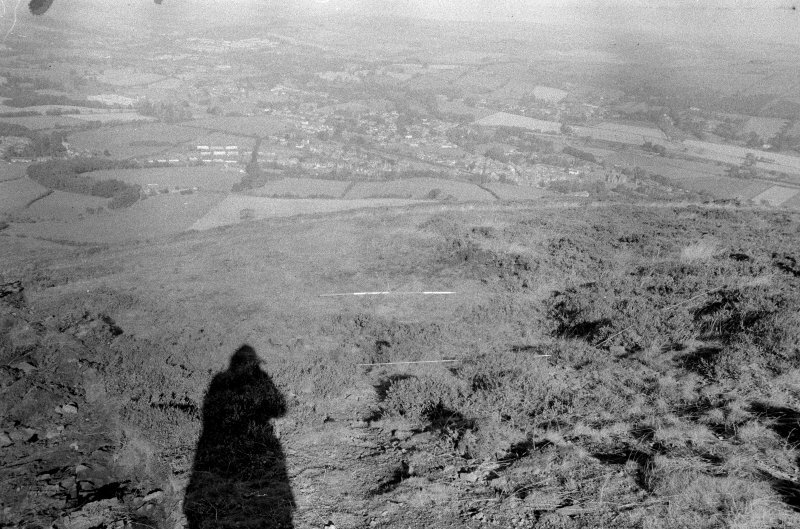 Steer and Feachem, K A and R W. (1954) A Roman signal-station on Eildon Hill North, Roxburghshire', Proc Soc Antiq Scot, vol. 86, 1951-2.